There are two main cities on the Big Island of Hawaii, the old town of Hilo and the pretender of Kono which sprung up when poor Hilo was devastated by a tsunami not once but twice. Hilo is the more traditional old town, whereas Kono is the tourism centre. 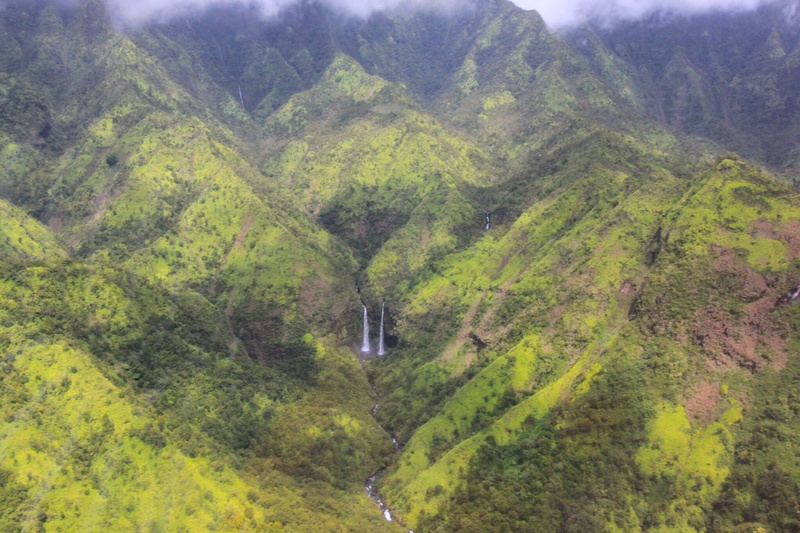 I flew into Hilo, which is closer to the Hawaii Volcanoes National Park, where I was staying. 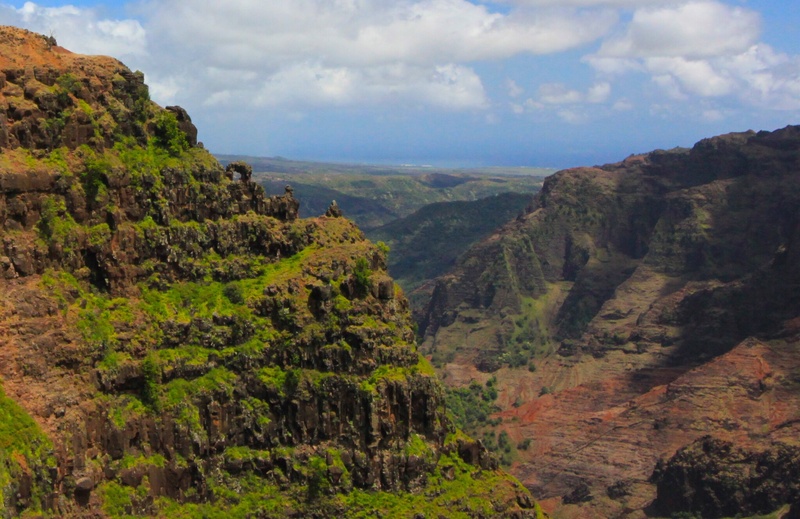 On arrival round noon, I was told that my hire car and GPS were at Kono, which is more than two hours away. I was told I could have a car but no GPS. This caused me a small wobbly moment, because I was born without an internal compass and am quite capable of getting lost on a trip to the toilets, let alone exploring a new island by car. However, I was told that even an idiot could not fail to find the park, as all I had to do was leave the airport, turn left, and turn left again when I saw the park after 45 minutes or so. And indeed the route did prove idiot proof. I just had to drive steadily uphill towards the Hawaii Volcanoes National Park. I paid my $10 and entered the park. I immediately pulled into the Visitor’s Centre to ask for directions to the hotel, which I then realised I could see across the road! 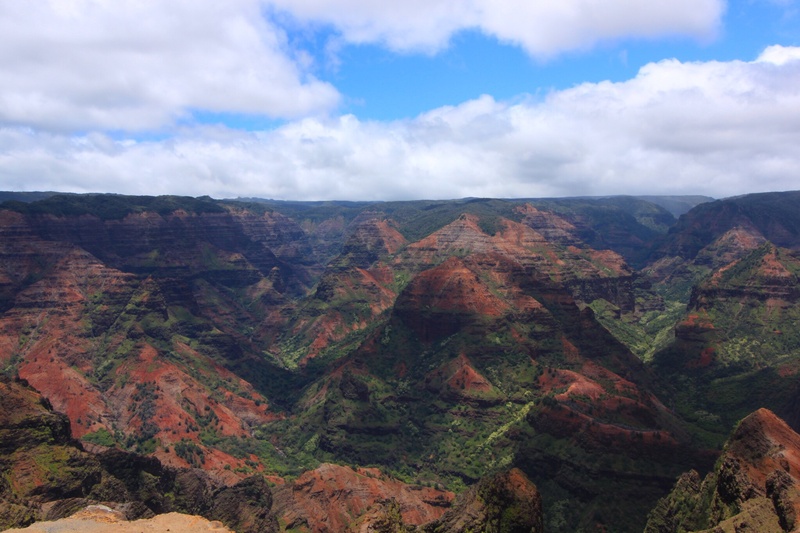 I checked in to Volcano House, the only hotel in the park. 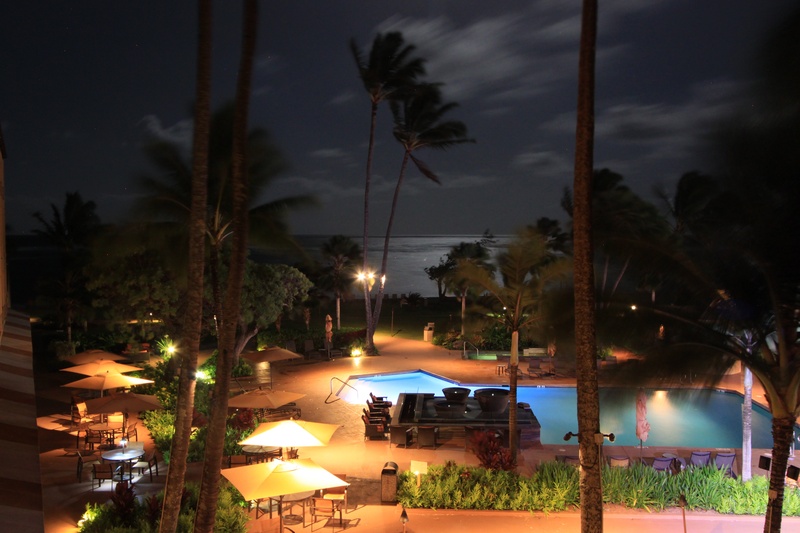 It has recently been refurbished, and is very nice, particularly if you have a view of the steaming Kilauea caldera. Sadly I had a view of the car park, which was the only drawback of the hotel. It is a bit noisy. I was running low on essential toiletries like deodorant, so for the sake of those around me I drove to the tiny town of Volcano outside the park to find the quixotic general store and was fortunately able to find what I needed. However, there was not a lot in the way of food which could be turned into a meal without the aid of a kitchen, so I had a snack at the hotel before setting out to explore. Unfortunately by this time it was about 4 pm, so there was not a lot of day left. I had a look at the steam vents, where warm steam rises out of the ground. 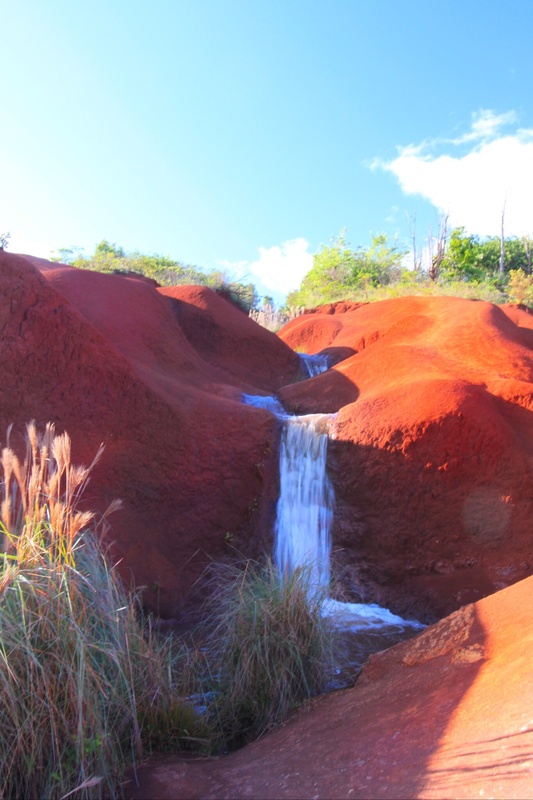 This is the result of rainwater making its way into the ground where it is heated into steam by the hot rocks below. It was chilly in the evening at that elevation, and many people were wearing just shorts and tee shirts as it had been a warm and sunny day. They stood in the steam for warmth, before realising that once they were wet with steam they were even colder when they left the warmth of the vent! 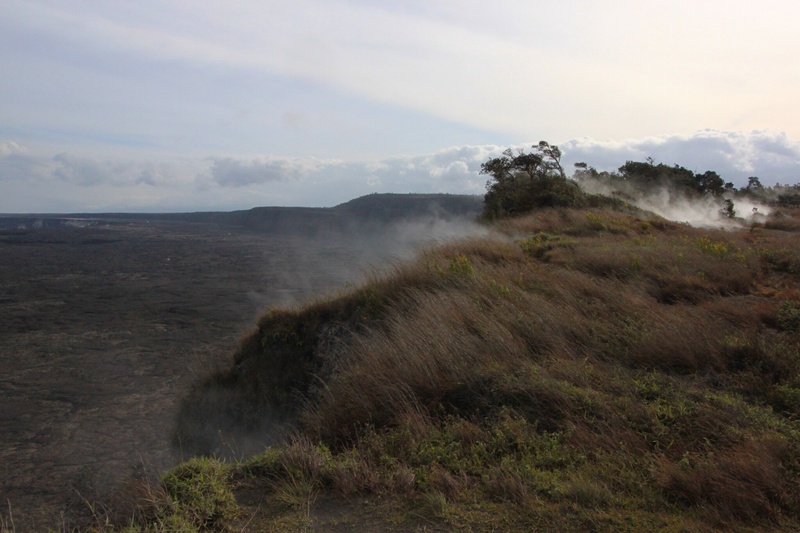 The steam rises all along the rim of the crater at steaming bluff, making it look like the setting for a rock concert. Like dry ice, it hangs in the air above the ground, but other than above the centre of the crater does not rise very high in the air. 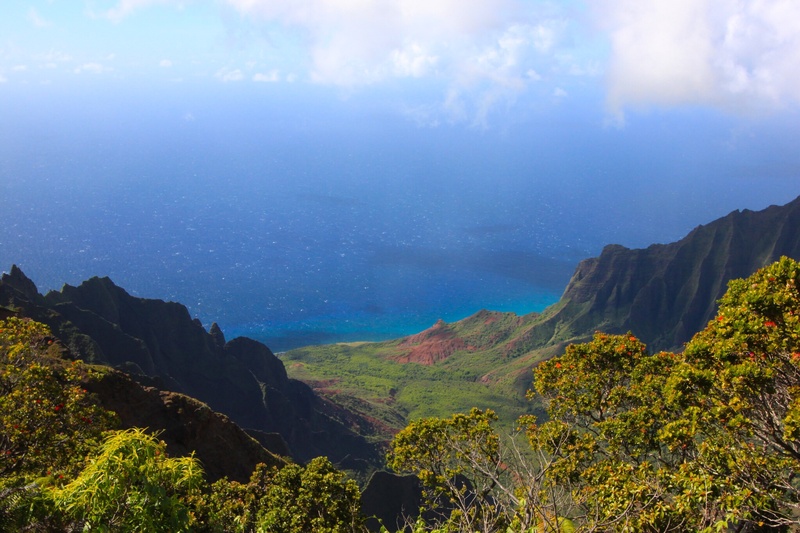 Unfortunately I began to feel the effects of the altitude, probably as a result of a very early start that morning to fly to Honolulu and then to Hilo, and after a brief exploration I returned to the hotel. I felt much better after relaxing for an hour or two, and suddenly realised I was missing a glorious sunset. I grabbed my camera equipment and rushed for my car. I contemplated taking a picture from the car park with a view of the road but a gorgeous sky, but decided to go immediately to find a nice view of the crater. In retrospect I should have just gone to the front of the hotel, and of course as soon as I got in the car the beautiful colours vanished and I missed the sunset. 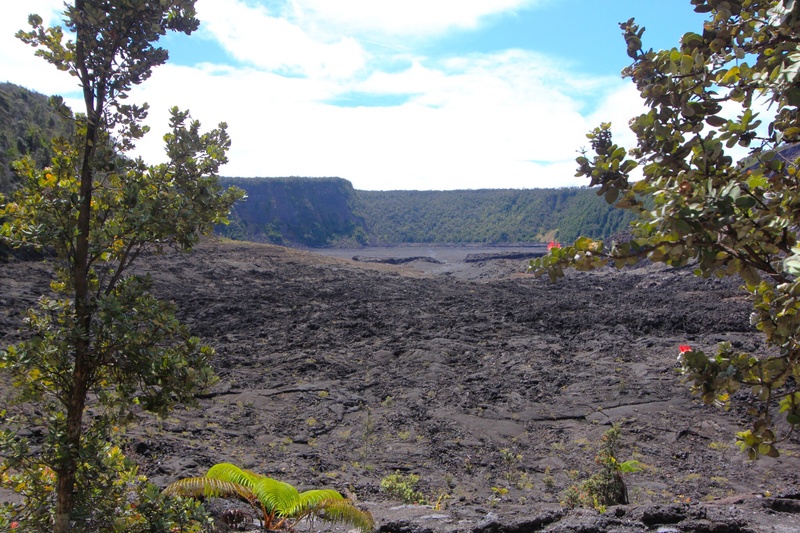 Undeterred, I set off for the Jagger museum (nothing to do with Mick, this Jagger was a volcanologist) where there is a crater (Halema’uma’u) within the Kilauea caldera which glows at night. This is an awesome sight, with steam rising from a glowing red hole in the ground into the inky purple sky. The best pictures were just before it got completely dark. I did feel smug with my tripod. 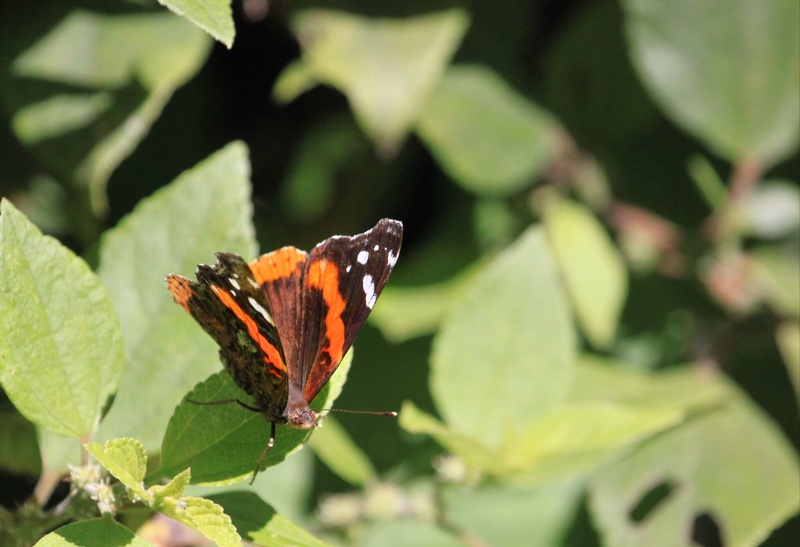 I was the only person to have one and was able to get much better pictures than those around me as a result. I eventually took pity on a couple next to me who were trying to balance their cameras on the low wall next to me to get the shot, and let them borrow my tripod. Halema’uma’u is a crater within a crater, where a huge section of the vast Kilauea crater dropped down into the earth below. 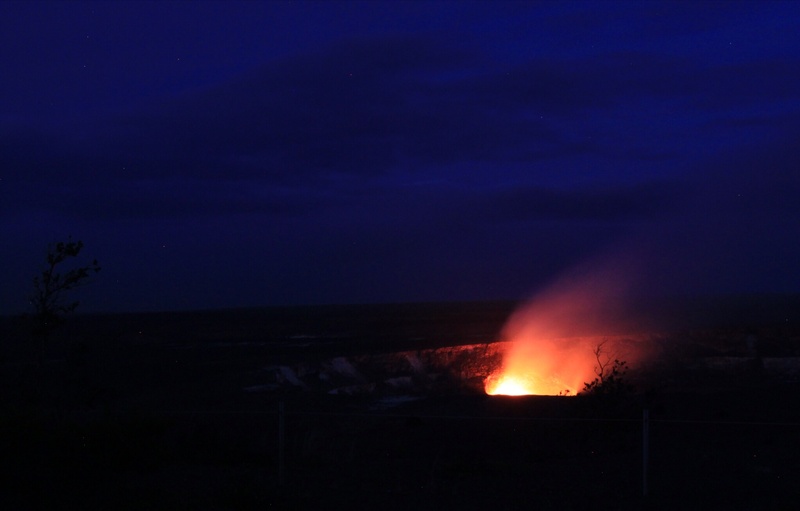 It is where the goddess Pele lives, and seeing that glow against the night sky one can almost feel her presence. Pele is still very much making her presence felt, and big sections of the park are closed due to eruptions, noxious gases or other activity. 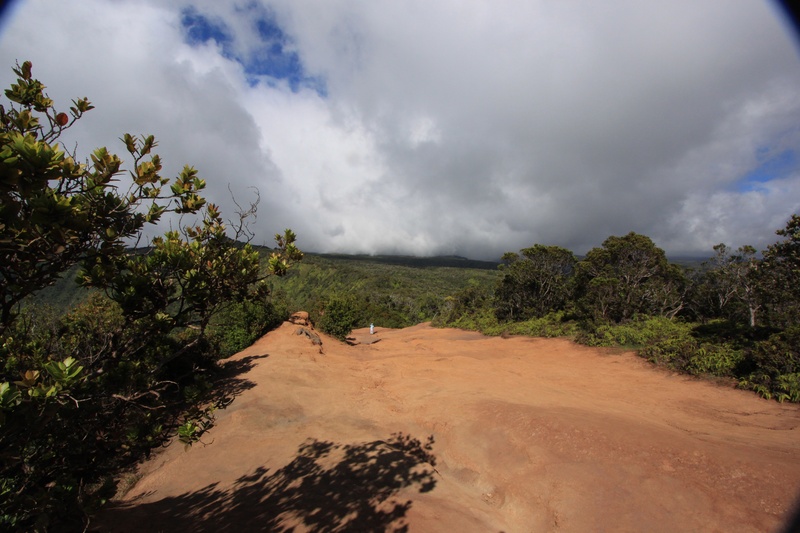 The next day I set off early to do the Kilauea Iki trail. The trail starts on the edge of the caldera. 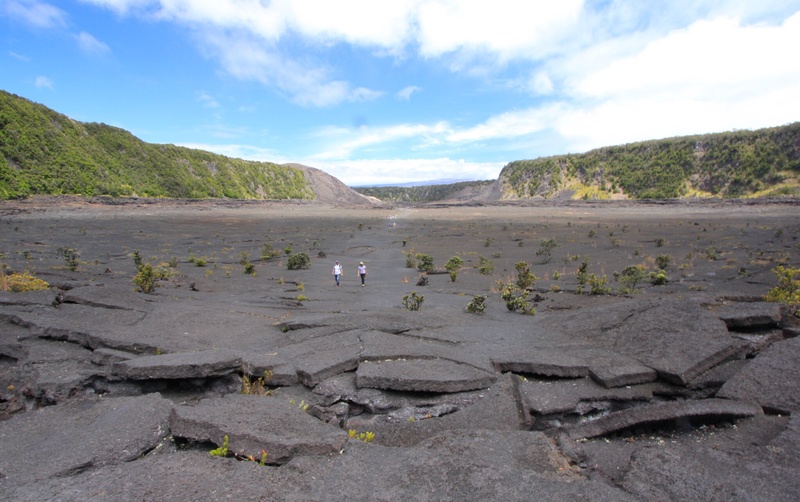 In 1959 a huge lake of lava collected in what was once a very deep crater. It provided an incredible spectacle which was closely observed by scientists. The lava bubbled in a vortex in the crater before hardening over the years into the black lake you can see today. The hike starts through the forest which remains above the devastated area. At first I had the forest to myself, and was accompanied by nothing but the sound of birdsong as I hiked slowly down towards the crater. Unfortunately I lingered too long looking for the birds I could hear in the canopy, and soon guided groups start to catch me. 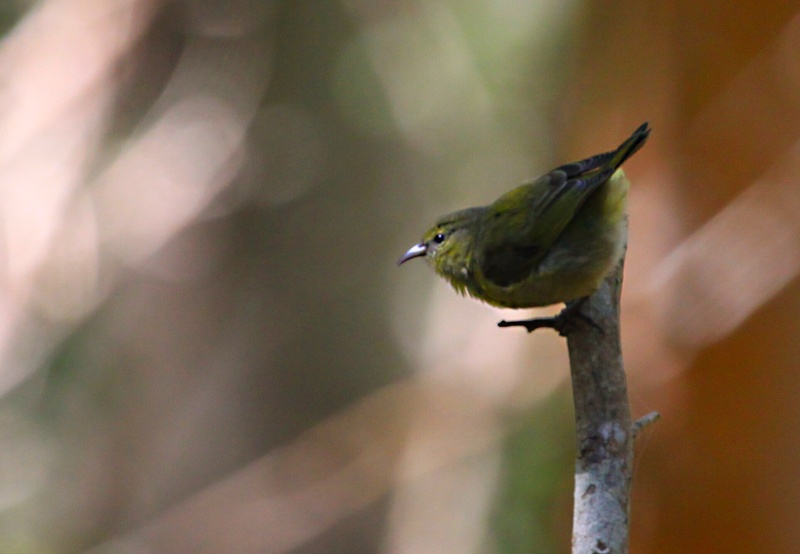 One polite group waited while I captured a shot of the beautiful apapane which I saw land in a tree above me. I let them pass and suddenly heard loud shouting behind me as someone tried to get an echo going across the crater. To my horror I realised that this loutish behaviour was from a guide. I could hear him coming from a long way off as he told his group about his high school career as a wide end receiver. “Good story” said a member of his group. That must mean something different in America as the story could not have been less interesting. I hung around to let him pass with his group, as otherwise I am afraid I would not be able to resist the temptation to toss him into the crater! The forest itself is fascinating. 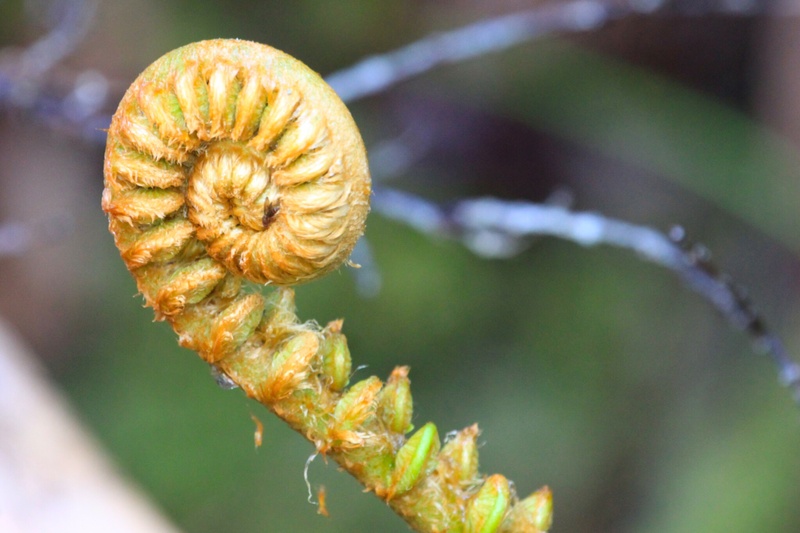 Filled with beautiful and slow-growing hapu’u tree ferns, which become top heavy and fall over, only to put down new roots and shoot up from where they have fallen. 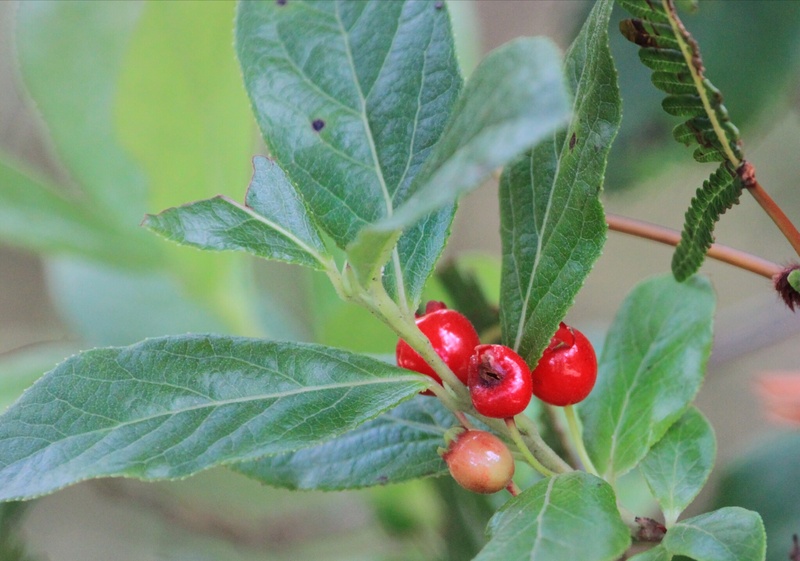 The poisonous akia berries look very similar to the edible ohelo berries – I decided not to test my ability to distinguish them. 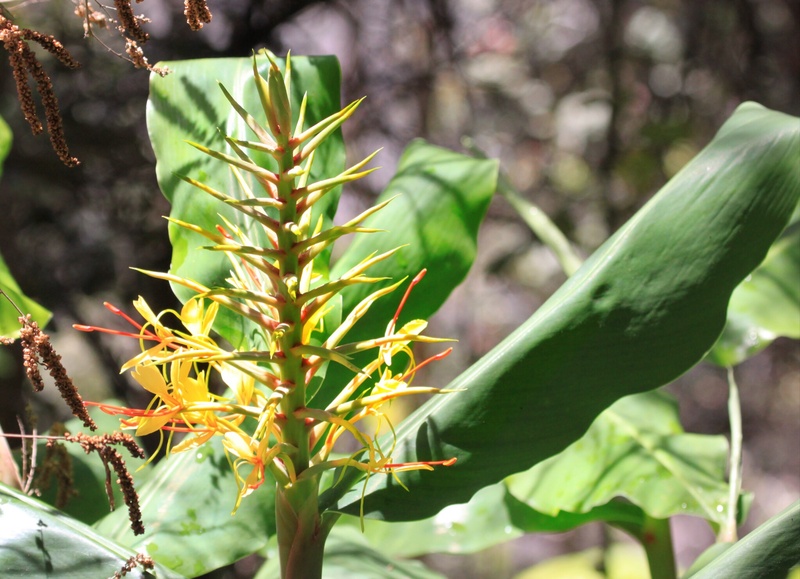 The forest is full of invasive ginger, which is pretty but impedes the growth of endemic species. It is dangerous work trying to clear it in this volatile area. Once down onto the lava lake, it was hot and windy as I carefully made my way across the surface. 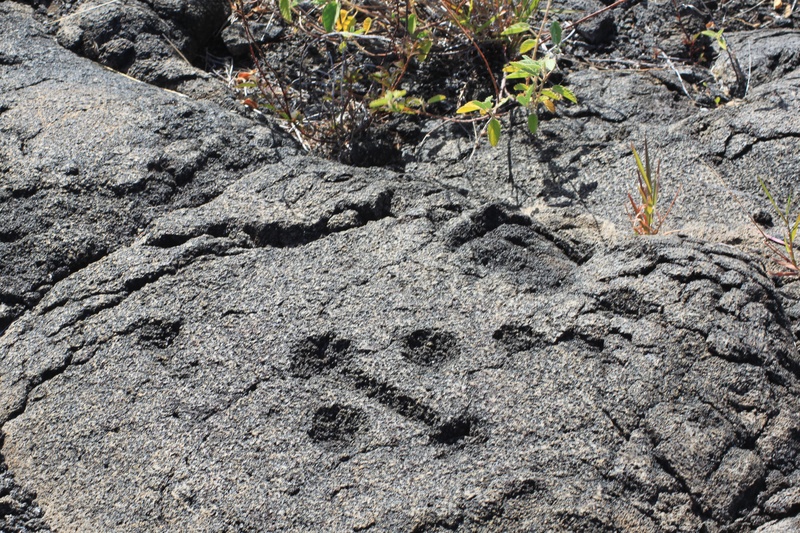 The lava rocks are black, dusty, and very light. From above the surface of the lava lake looks smooth, but it is far from it when you get down there. In places there are deep fissures, and in other places great rafts of lava sit like black icebergs above the surface. 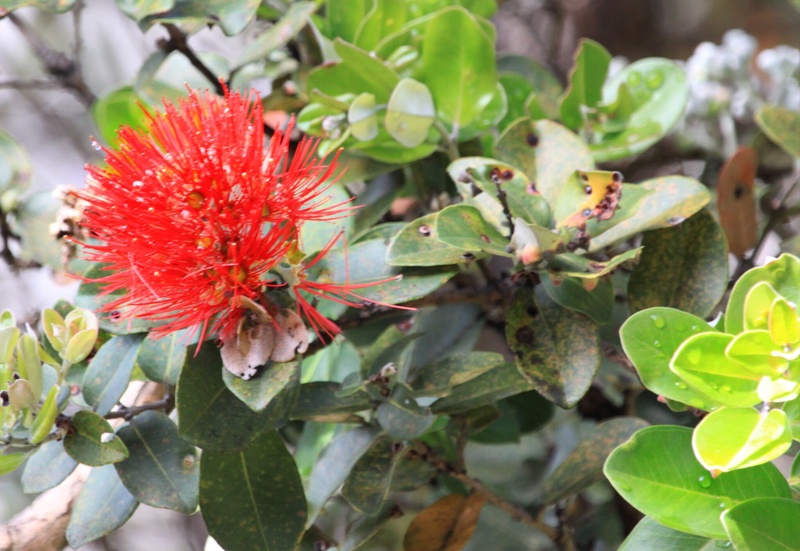 What is really interesting is seeing how life is beginning to take root in the lava, as the ohia grows on the rock. 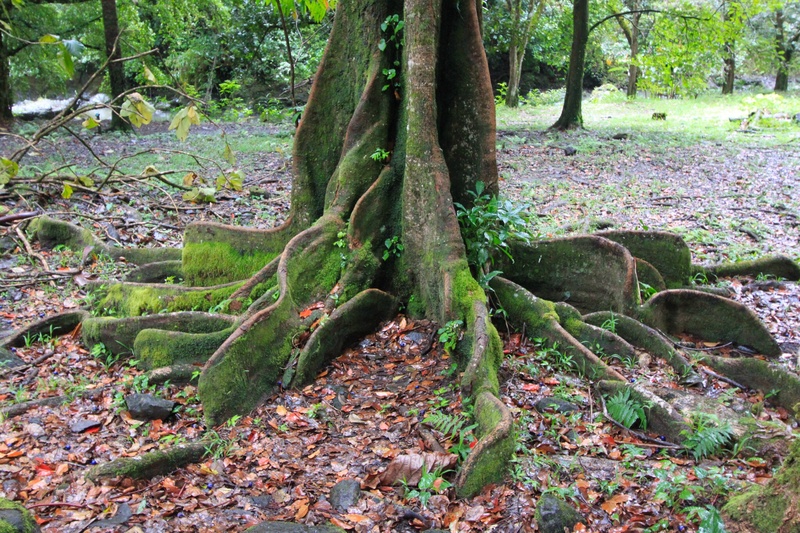 Over time, it is clear that the forest will reclaim the lake of lava which covered the forest 55 years ago. On the other side of the lake there is a steep 400 foot climb along switchbacks in the forest before emerging in the car park for the Thurston lava tube. This is the busiest attraction in the park, and I confess to being underwhelmed. 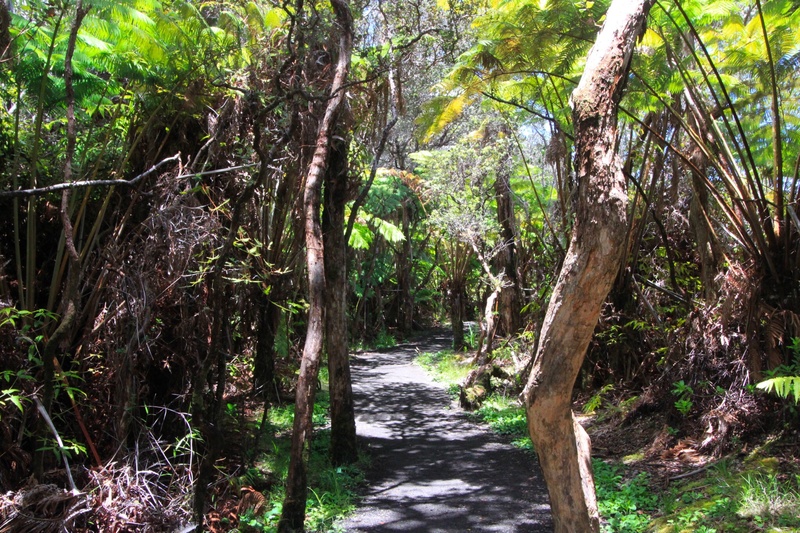 There is a short hike through an ohia forest, which would be very pleasant if one could hear the birdsong over the chattering of the masses. Then there is a walk through a lava tube. It is a tunnel of lava about ten feet high and wide. The walkable section extends for about 100 metres and is lit along the way. Although the lava tube does extend a long way beyond this, it is not safe for the public. It is interesting enough, but I am not sure it is deserving of the mayhem. There are more exciting things to do in and around the park. The lava tube is the home of the happy face spider. I did not see one, and despite my fear of spiders I am quite sorry I did not, as they are a cool insect. Look them up and you will see what I mean! Another short hike through the trees took me back to my car. I had to return to the hotel for some food before going further along the Chain of Craters Road. I decided to try the restaurant, as it is hard to get a dinner booking there. It was a disaster. First there was no tofu in my tofu stir fry, then no goats’ cheese in my goats’ cheese salad and when I found plastic in the stir fry, I gave up. Still, at least they did not charge me for it! The restaurant must be famous for the view, is all I can say! I headed further down the Chain of Craters Road. 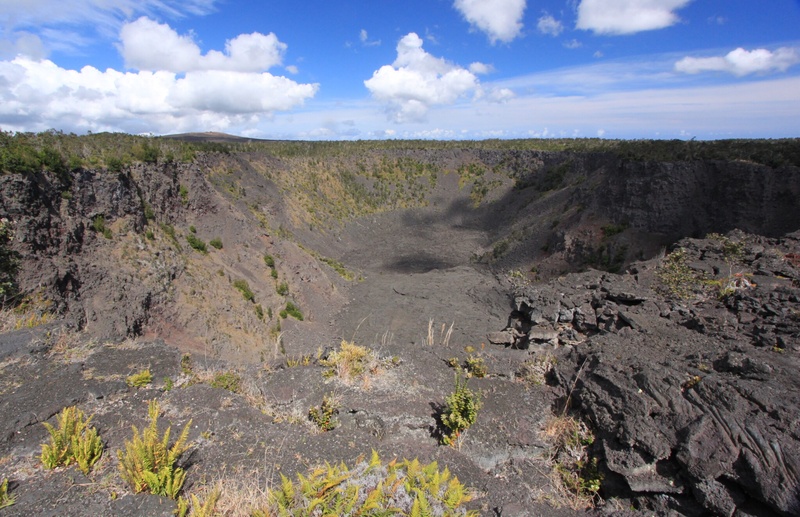 The series of deep craters shows you the extent of the volcanic activity in the area, as do the lava flows which the road crosses. 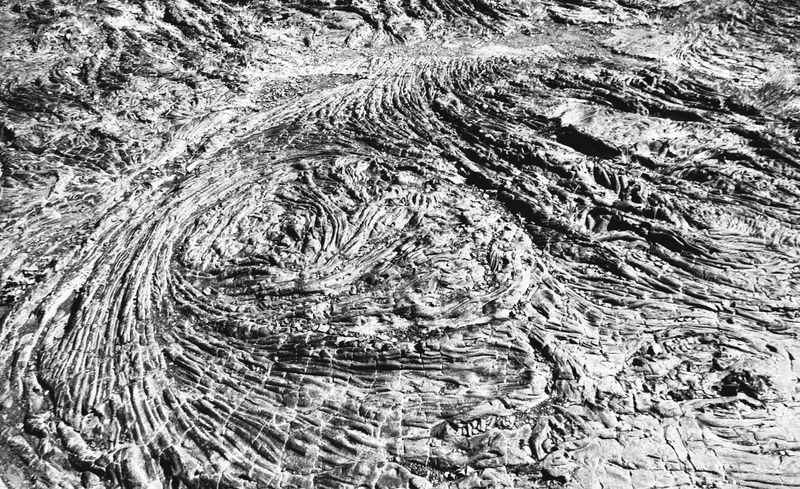 Each huge crater looks like the scene of a massive meteor strike. 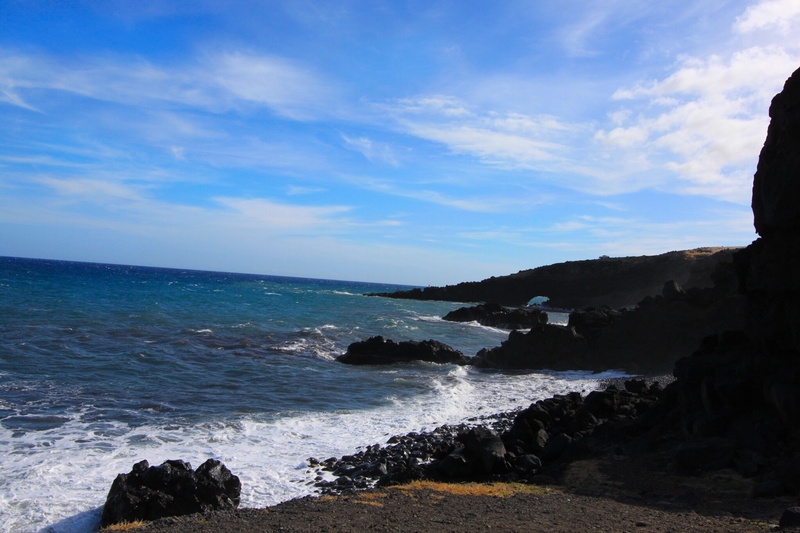 The lava has been flowing down to the sea for centuries in this area, and in 2003 obliterated part of the road. You can still see lava flowing into the sea, but to do so you have to hike 11 miles across the lava, so I decided not to attempt it. 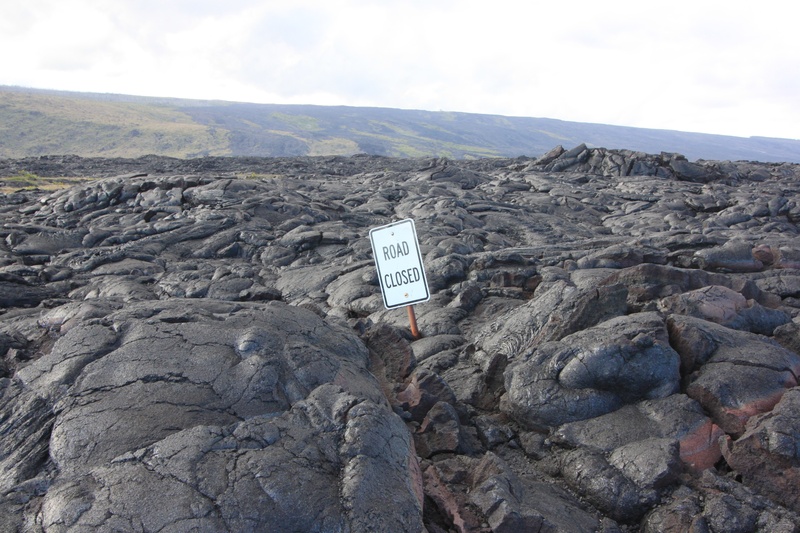 I satisfied myself with the shot of the road closed sign buried in lava. To get to the point where the lava has flowed across the road, there is an easy, if hot and boring, mile or so trek along the road from the car park. I scrambled for a few hundred metres over rocks that until about 10 years ago were molten and buried in the earth. It is horrible and beautiful all at the same time. I felt like I was in a Tolkien novel. 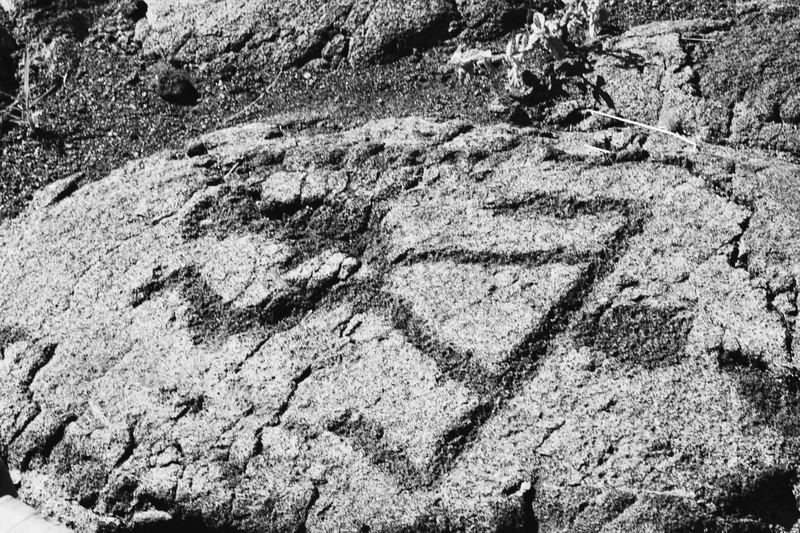 Near the end of the road, there is a mile and a half out and back hike to some petroglyphs. It is an easy hike, mostly flat, into a strong headwind which provided much needed air conditioning. I practically flew on the way back! 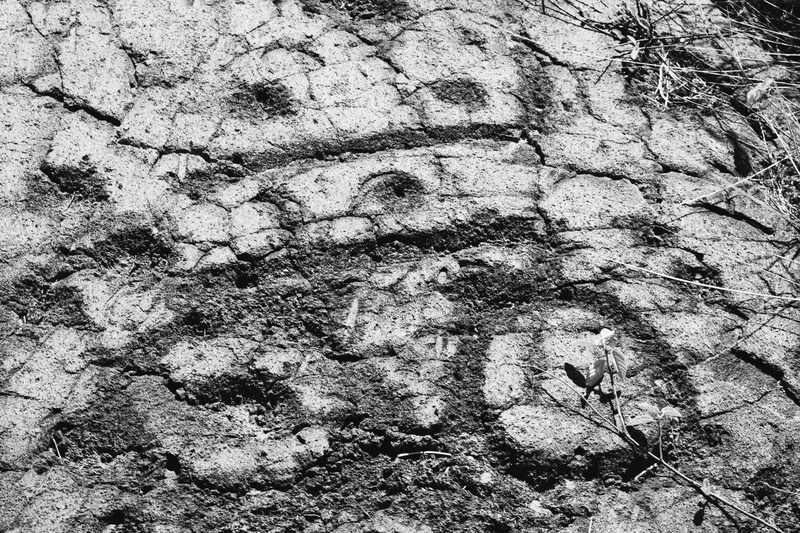 I could not discern the meaning of most of them, but one makes me think the carver was keen on cycling! The holes were to contain the umbilical cords of babies. Parents would place the cord in a hole and cover it with a rock to bring good health and long life to the baby. Finally the road reaches the sea. 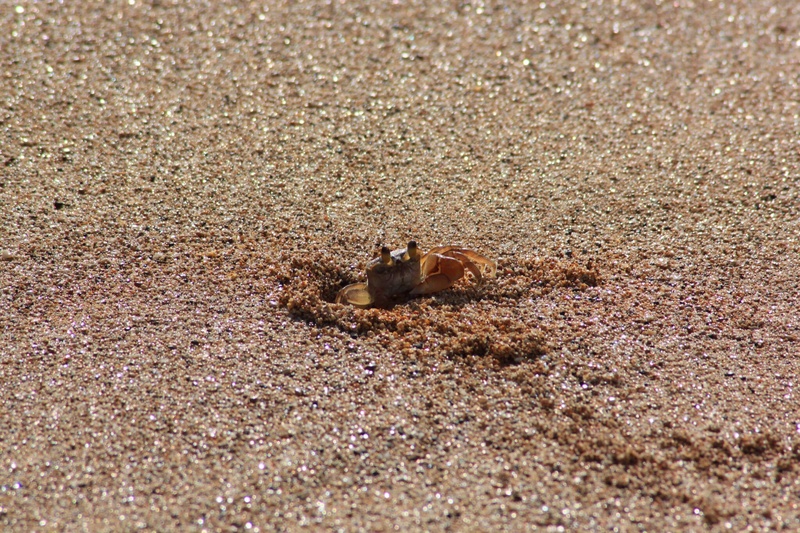 As I went to look at the Holei sea arch, located just where the road ends, I spotted a turtle about 30 metres out. I tried to get a decent shot of him, but in strong winds and choppy seas, I was not able to do so. I decided not to try to photograph the petrels I saw flying around because of the high winds, and later saw a sign saying they were rare to see, being critically endangered! I had another look for them after my hike to the end of the road, but of course there were none to be seen! All the the hiking has obviously tired me out, because on the road back I give a tour bus a huge fright as I find myself driving on the left! I forgot my mantra and obviously have left leaning tendencies! They probably thought I was Australian, as very few Brits make it out here. Fortunately I was going slowly and saw them in plenty of time, but I reminded myself to repeat the stay on the right mantra every time I got into the car. 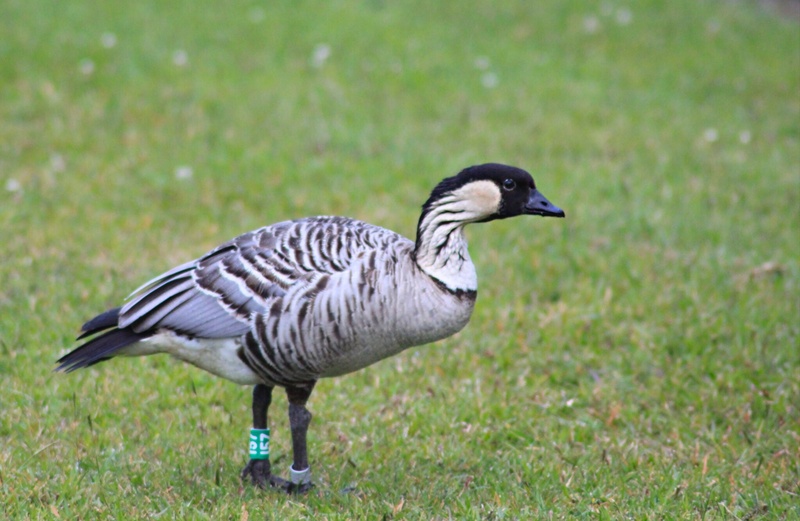 However, I did manage to track down some nene, Hawaii’s endangered national bird, grazing on the lawn of the army camp in the park. Having seen signs on each island warning me of nene crossing the road, and having obediently slowed down each time (apparently they are not very good at evading cars) and not seen a single one, I was delighted I would not be leaving the islands without seeing some of these handsome geese. The next morning I went to find the area known as the Bird Park. 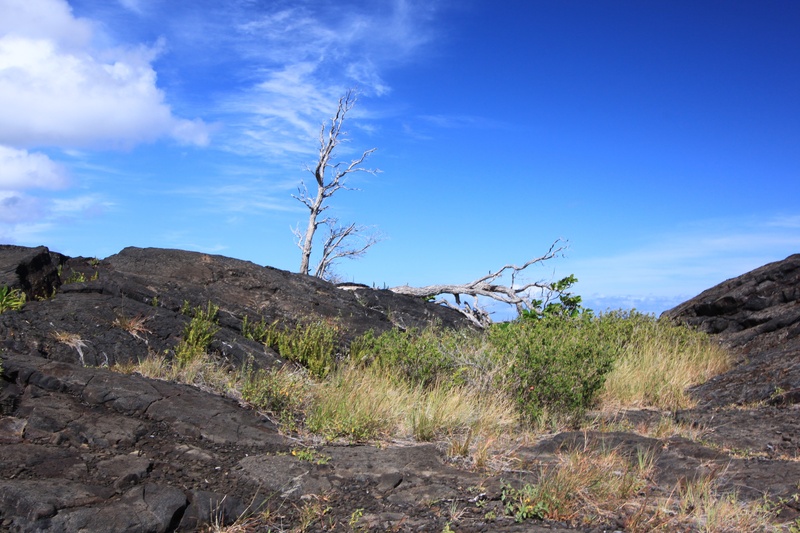 Kipukapuaulu is an area of forest which has survived amongst the lava which, after extensive work by conservationists, has been denuded of invader species and replanted with native Hawaiian trees. 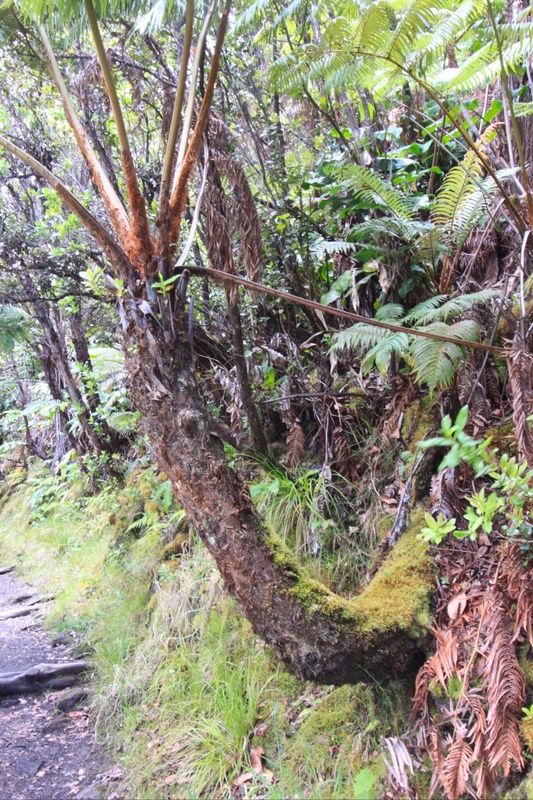 An island of forest amongst the lava like this is a kipuka in Hawaiian. Being outside the park, it seems to be largely ignored by tourists, and I had the forest to myself. I wandered delightedly through the woods along the gently rising trail, craning my neck to look for the birds I could hear all around me. 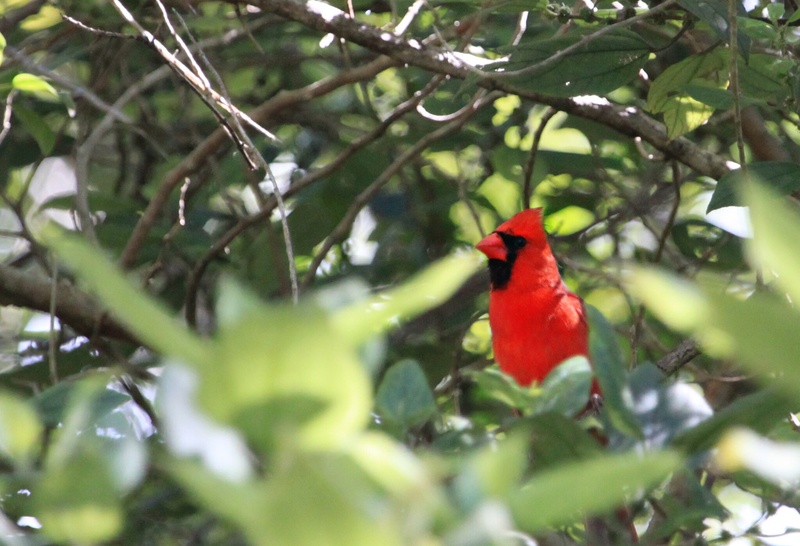 Almost immediately I saw a bright red bird, but he flew away as soon as he saw me. The beautiful song of the lark surrounded me. I could see them all around me, but they are busy little birds and I was not quick enough to photograph them. 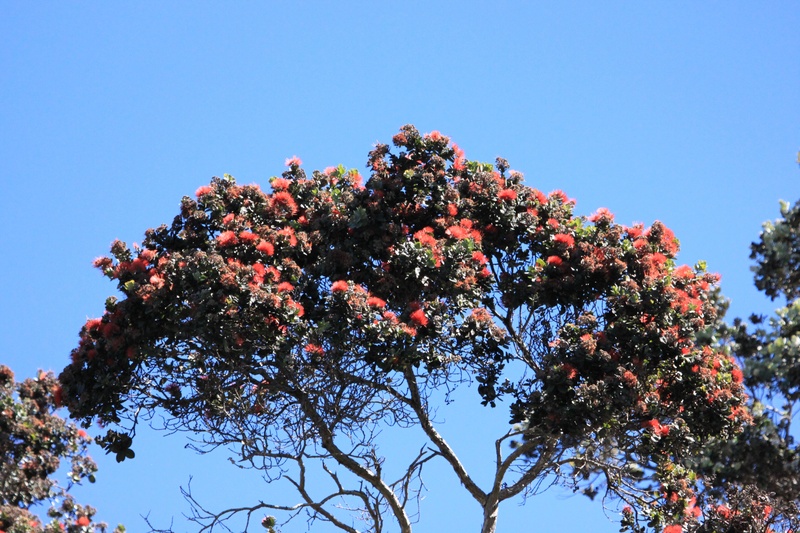 Overhead I could hear the whirring of the wings of the apapane as it fed on the bright red ohia flowers high in the canopy. 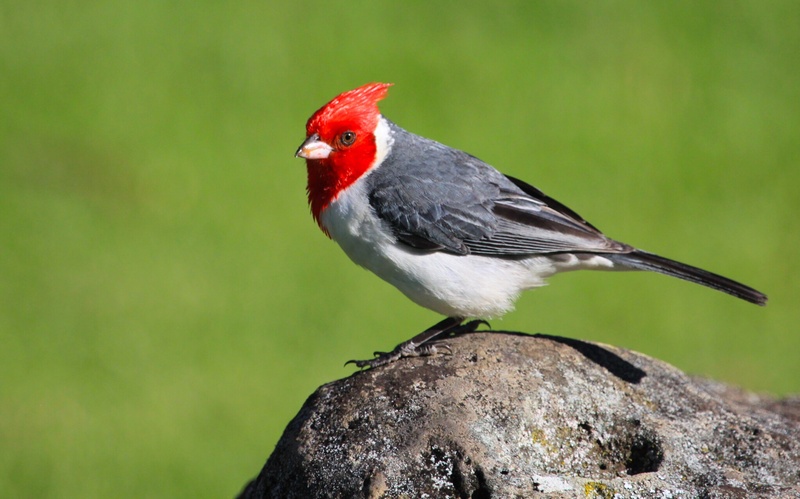 I saw brilliant yellow saffron finches, a gorgeous olive green Hawaii amakihi and green and yellow red-billed leiothrix and got my shot of the crimson bird, which turned out to be a northern cardinal which has a loud a melodic chirp. I could have spent all day there, but sadly had to head back to the hotel to pack. This was my favourite bit of the Big Island. Volcanos are all very well, but you cannot beat something with a heartbeat! Make time for it if you are ever here. 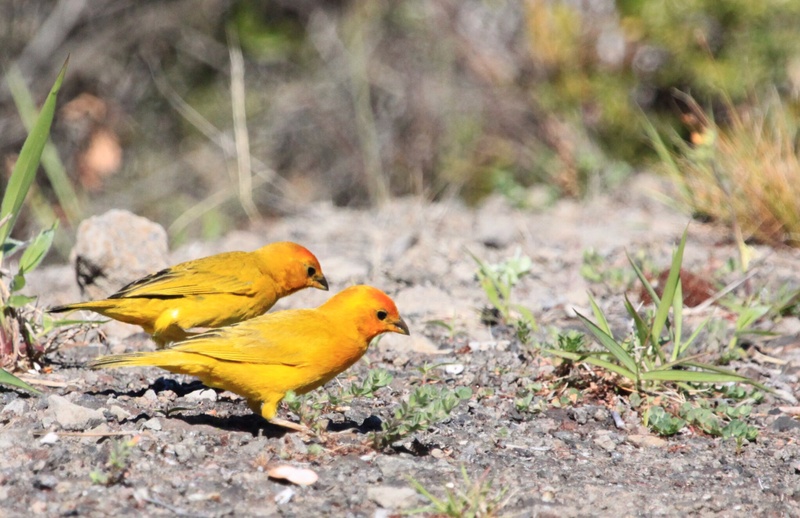 It is only a gentle one mile or so hike, and about 10 or 15 minutes by car from the park gate but so peaceful and filled with such pretty birds. 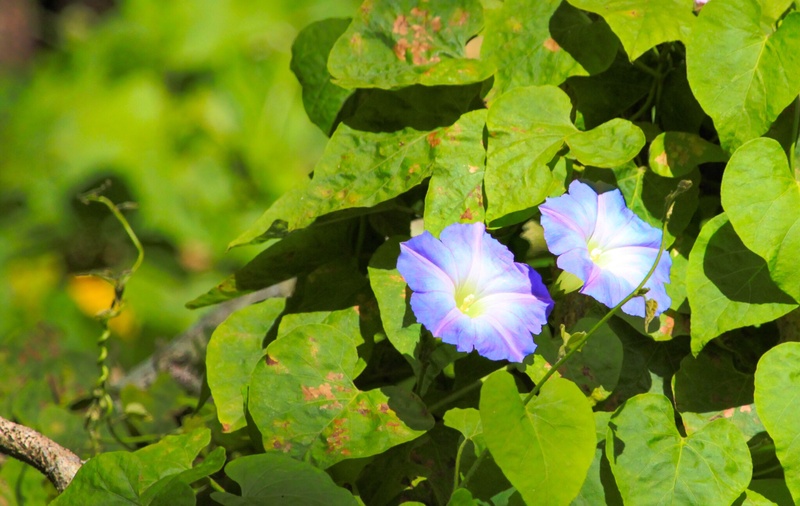 In addition to the birds, I saw lots of Kamehameha butterflies, one of only two species endemic to Hawaii, as well as morning glory and gorgeous trees. There was just time to check out the tree moulds on the way back. 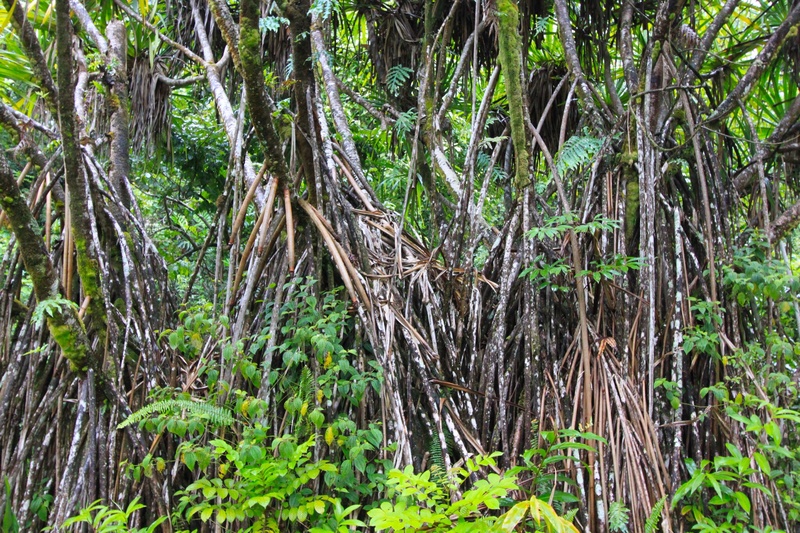 These are tubes which show where ancient lava flows have overrun the rain forest. 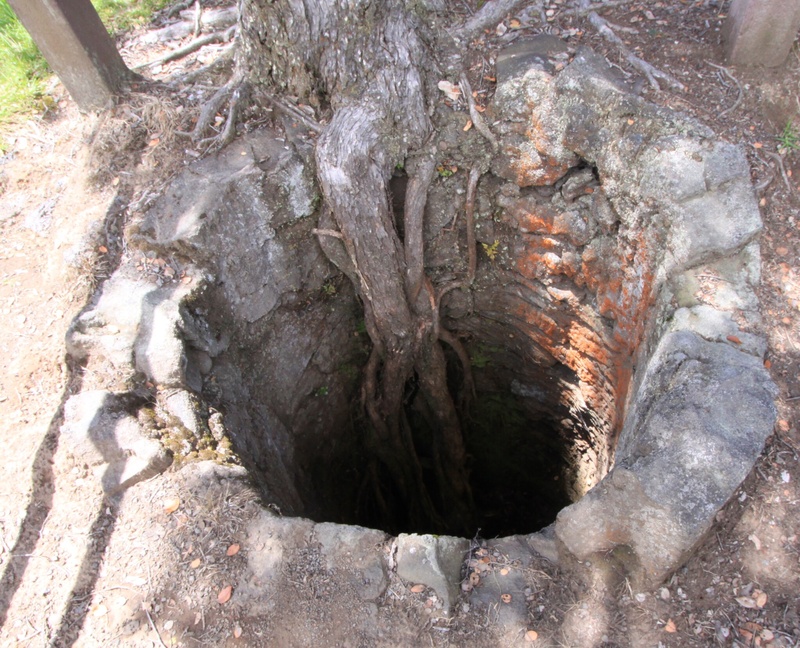 The lava surrounds the tree, leaving a hollow where the tree was. Before I headed back to the airport, I discovered something I wish I had found the day before. Behind the general store in Volcano is Cafe O’hia. They make huge and delicious sandwiches. Enough for two, or two meals, and they also sell trail mix and snacks. I suggest stocking up here before hitting the trails in the park. I am writing this in Hilo airport, which is a delightful building. Really just a large shed, it is decorated with sofas and arm chairs which remind me of my grandmother’s furniture. It is so delightfully old-fashioned I do not even mind that the sofa on which I am sitting is rather soggy and uncomfortable! 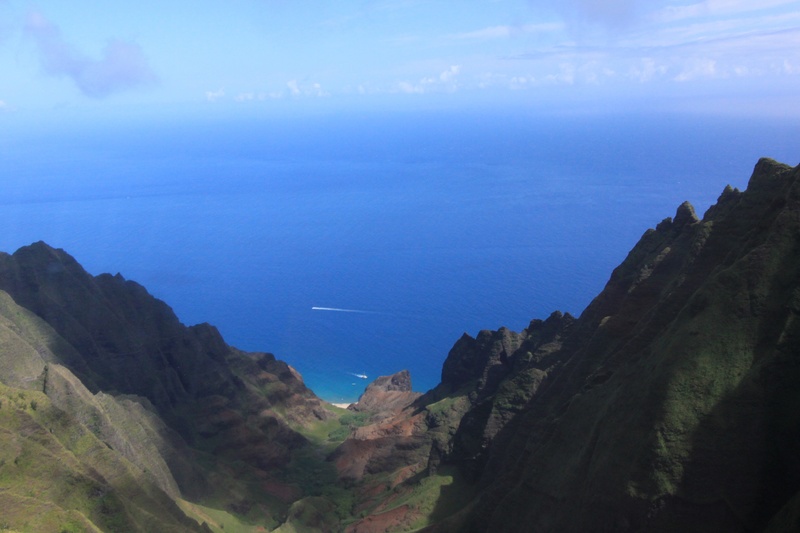 It is a shame I did not have more time here on the Big Island, as I would have liked to dive with the manta rays at Kono. This for me, is aloha to Hawaii, as I now head off to spend the night on Oahu before heading to Sydney first thing tomorrow. Hopefully I will have a final treat and see lava glowing out the plane window. No such luck, but I do see Maunu Loa rising majestically above the clouds. 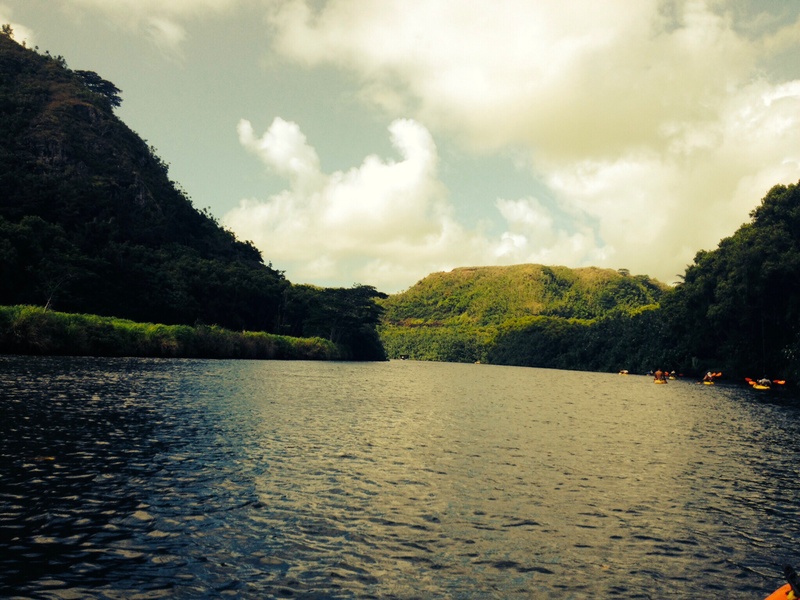 This entry was posted in Hawaii on 21/06/2014 by paulaclarke. 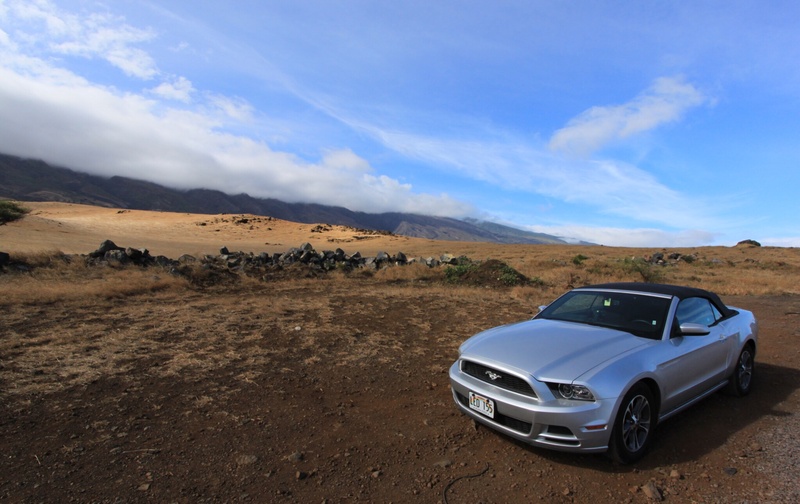 Somehow, despite my protestations that I was pale and freckled, a nervous driver, and entirely satisfied in a European sort of a way with a compact car, I left the airport in Maui with a convertible Mustang. This is a very impractical vehicle, as one can barely see when sitting in it as it is very low slung. Having never driven an automatic before, I bunny hopped my way out of the car hire lot. 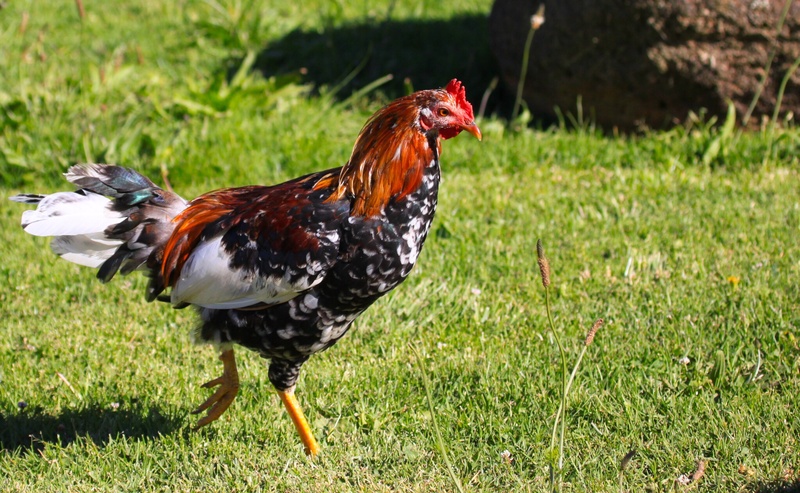 Once I got the hang of not needing to put my foot on the clutch when braking, things went much more smoothly, and chanting “stay on the right, stay on the right” repeatedly to myself, I set off towards my hotel. Soon the satnav died, leaving me with no idea where I was going, but eventually I did make it there in one piece. The room was large, last decorated circa 1980, but pleasant enough, looking out over a golf course. Once again I was told I would have to pay for wifi outside the lobby, making updating this blog a challenge. I booked myself on a sunset cruise so I would not go straight to bed, as there was a three hour time difference and I had got up at 3.30am to leave for my morning flight from San Francisco. The cruise was more than just a way to off set jet lag. 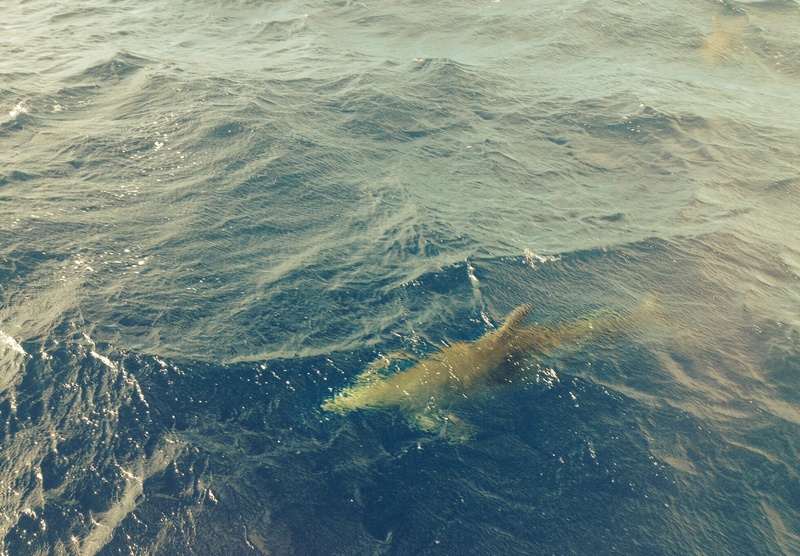 Any thoughts of sea sickness were banished when some dolphins swam so close to the boat that I was able to snap them with my phone. Watching them for a few minutes cured my nausea, and even though it was not the most spectacular sunset ever seen, it was a fun evening with Maui’s only all female crew on the Teralani and chatting to a very nice couple from Sacramento. 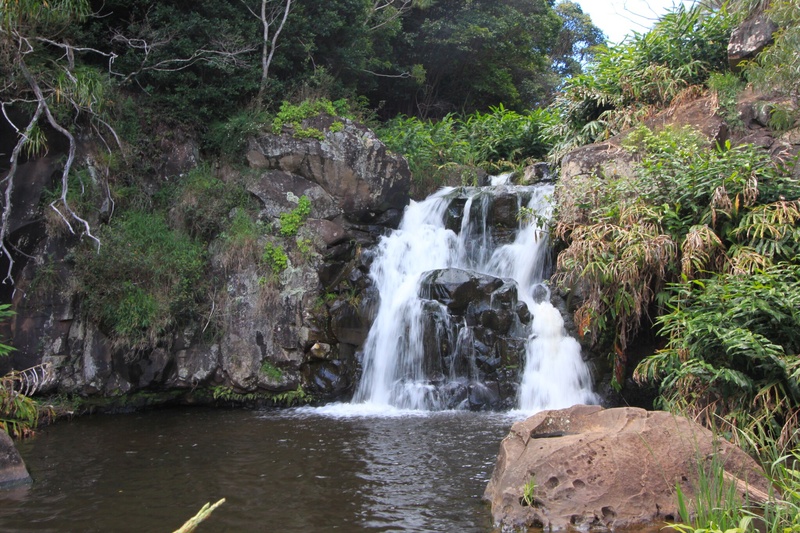 I was also warned that the drive round the Hana Highway, which I planned to do the following day, would be tough. Look closely, there’s a car in there! 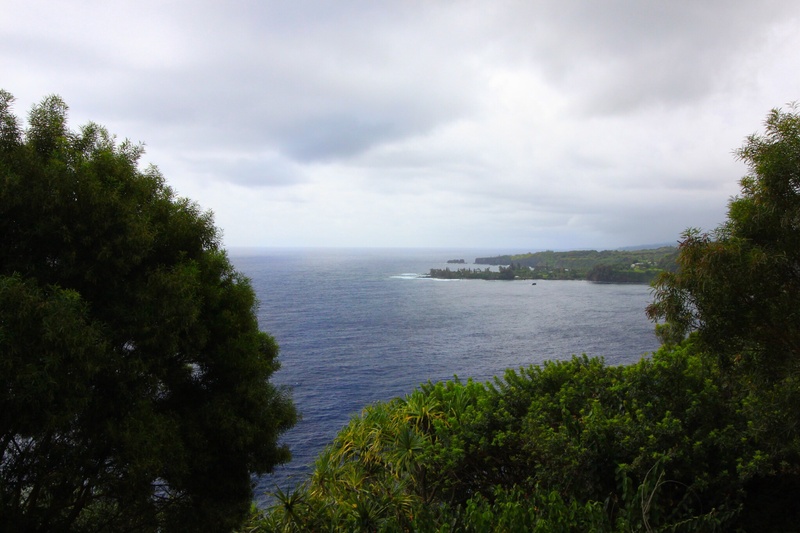 Despite the warnings, I decided to test my new-found wrong side driving confidence with a trip on the Hana Highway. For those unfamiliar with Maui, it is shaped a bit like a foot with a giant big and only toe. If you picture the foot pointing to the left, most of the hotels are on the bottom of the big toe in West Maui. 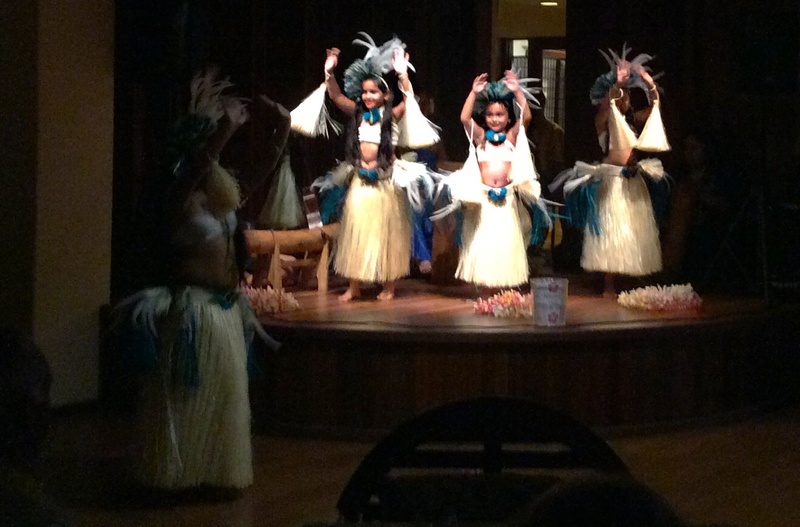 Hana is on the heel in East Maui. It is not too far away, but it lies on a narrow and winding road that is most definitely not for the faint of heart. 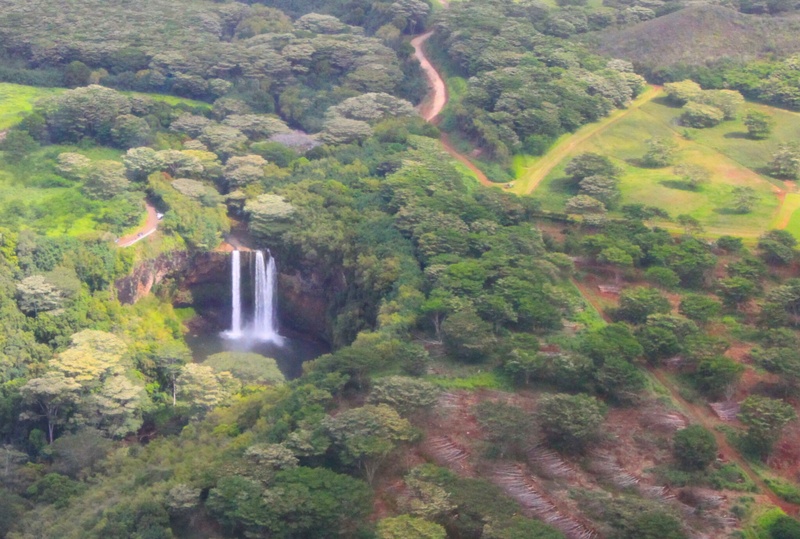 Along this road lie many stunning waterfalls. 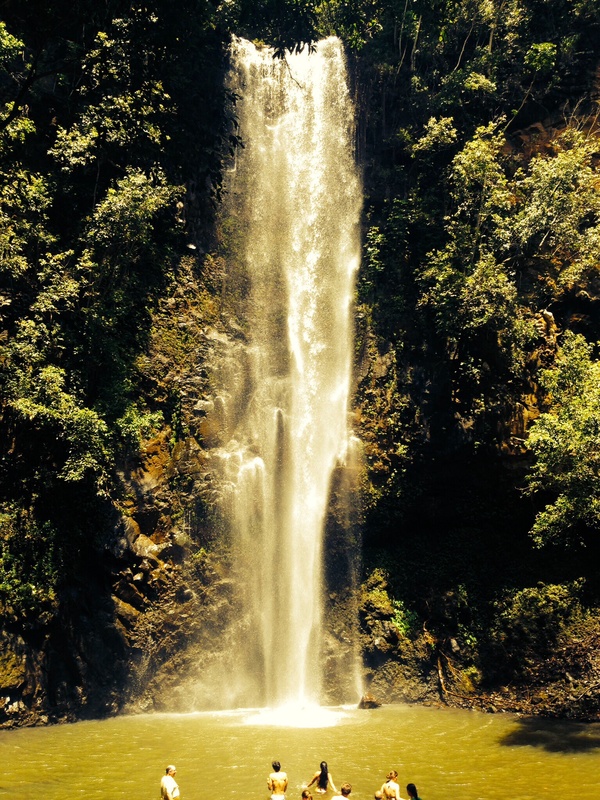 But the experience was not really to be about the scenery and the waterfalls, it was about the road. Ah, the road. It is so narrow and winding it has a speed limit of 15 miles per hour, occasionally rising to a speedy 25 miles an hour, but dropping to 5 or 10 miles per hour on the bridges. Let me tell you about the bridges. Along the road there are no fewer than 54 single lane bridges along this two way road. 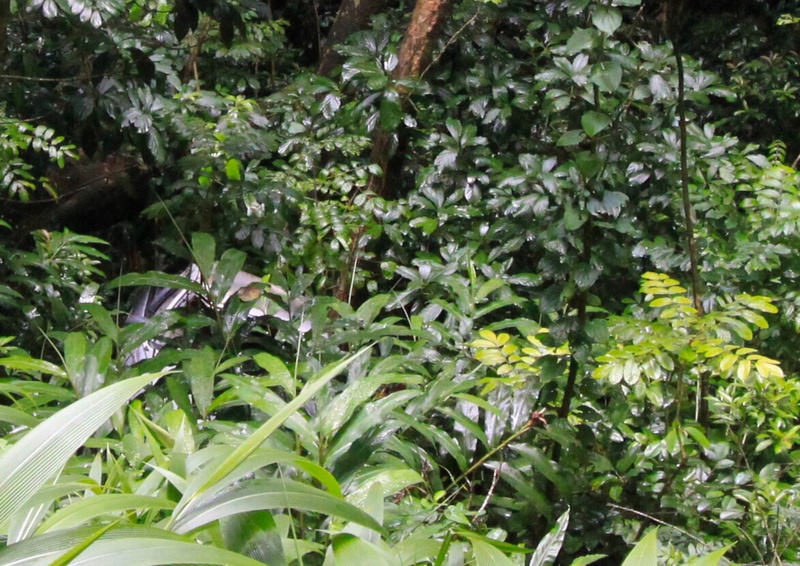 At each one, you have to slow to a crawl, and peer through the dense rainforest foliage to determine whether there is any on-coming traffic. If it appears not, you can cross. If there is, you let them past. As these bridges usually mark the spot where there is a waterfall, on either side there will be pull-outs with space for a few cars to park. For the first part of the trip, I found that many of the spots I had read about in the guide book had no available parking, so I was not able to stop. After having to pass a number of the sights, I eventually stopped at a pull out simply because it was there and free. 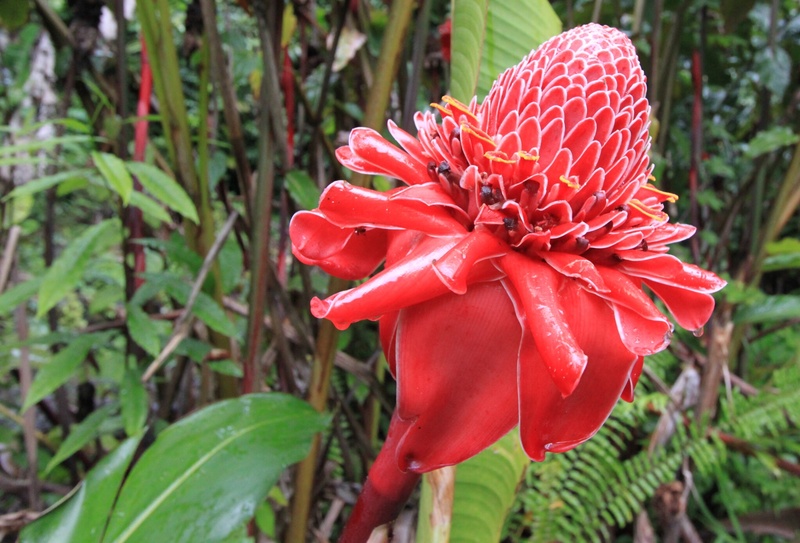 There was not much to see other than rainforest speckled with orange flowers. 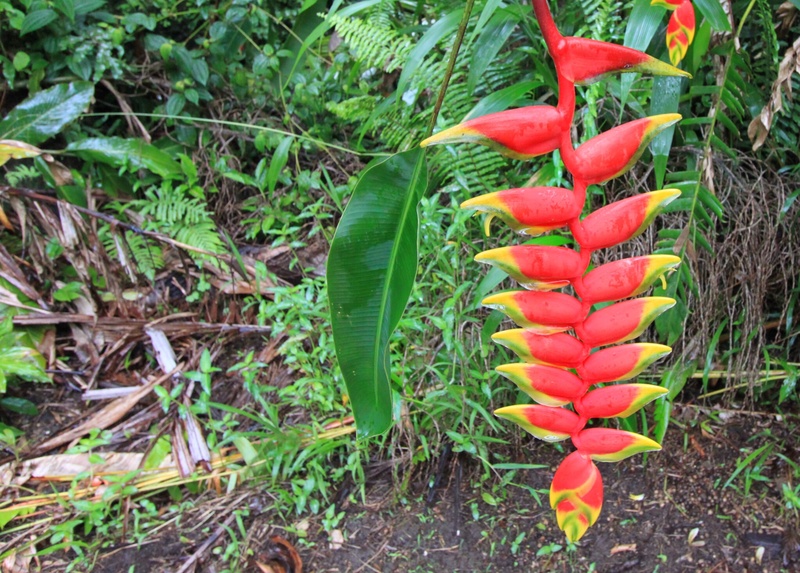 These are really pretty, but apparently are an invasive species called the African tulip which is destroying the indigenous vegetation. Having spent the drive to that point in a state of abject terror at the state of the road, I decided to relax, put down the roof on my over-priced hire car and start to enjoy myself. 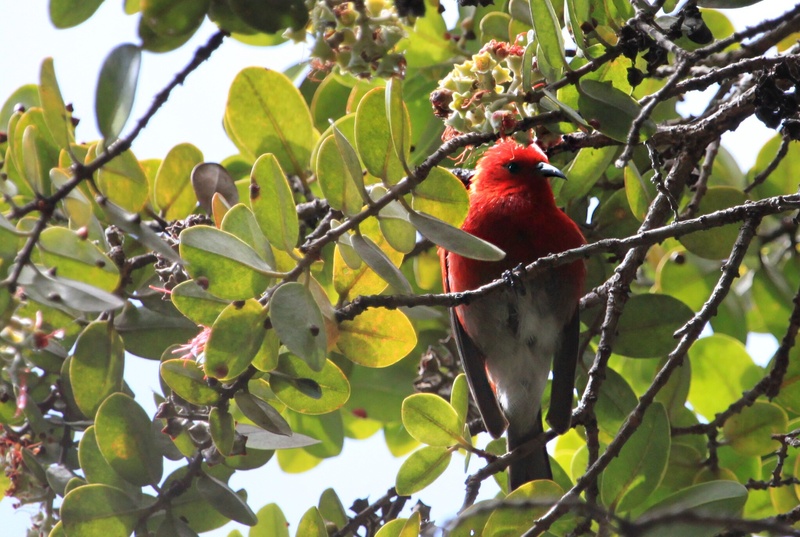 I stopped again at Kaumahina State Wayside Park, where I attempted to photograph a Brazilian cardinal (a bird not a cleric) but it was chased off by someone whilst I was changing lenses. There was a nice view from the hill just beyond the restrooms, though. 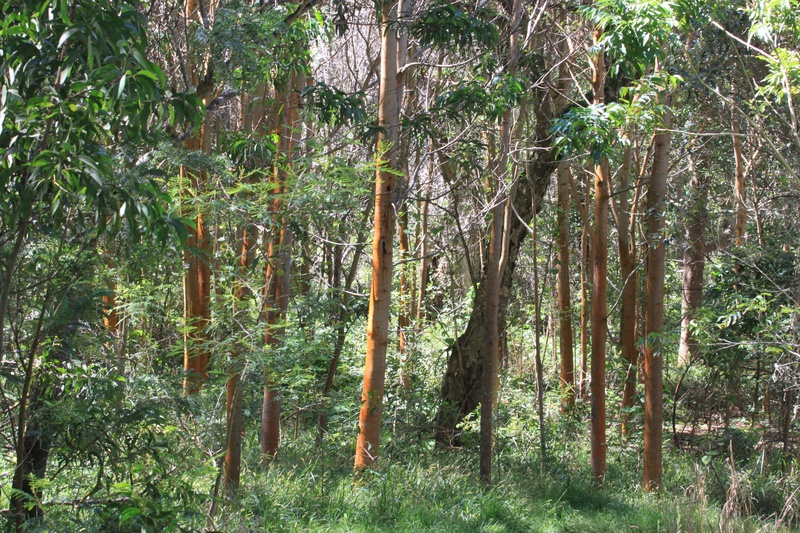 In this improved state of mind, I was excited to see that there was a spot available at the Ke’eane Arboretum, so I stopped to go and look at trees. Not even the sight of a car at the bottom of a ravine by the entrance could spoil my mood. A short hike through the trees was very pleasant. 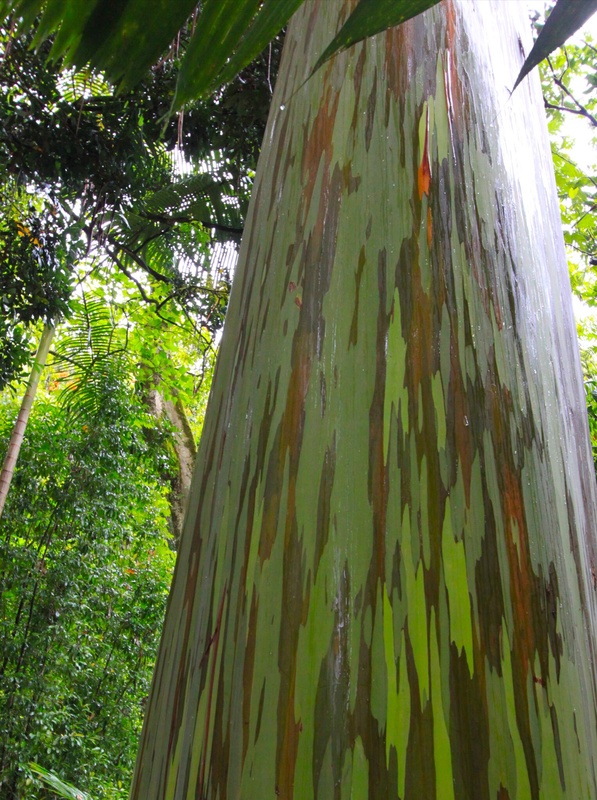 The Australian rainbow eucalyptus are particularly pretty. 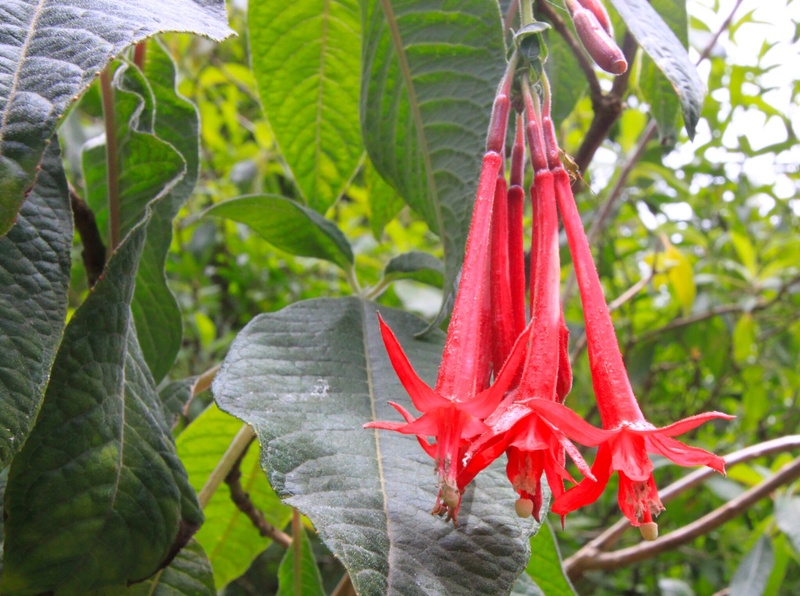 While I was there, it began to pour with rain but I took shelter under a densely leaved tree and stayed mostly dry. Unfortunately it then rained heavily at regular intervals for quite a way. I suppose the clue is in the term rainforest. And the fact that the water for all those falls has to come from somewhere. I turned off at Ke’eane to see what was there. I found Sandy’s, a stall staffed by friendly girls selling delicious banana bread and much needed water. There were also resident cardinals who like to ask for crumbs, tame as sparrows. I returned to the car for my camera thinking I would not have a better chance to get my shot when it began to rain so torrentially I could barely see the little red headed birds. I decided to press on. You will note no cardinal shots on this post! 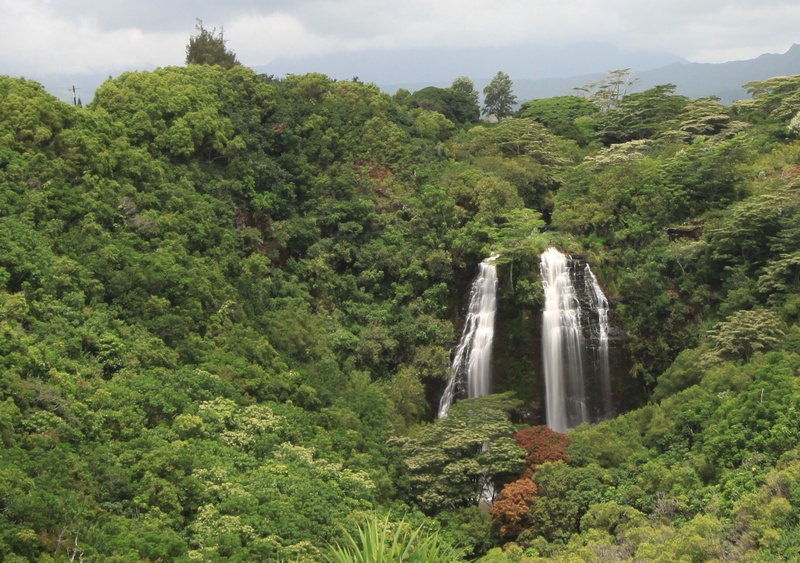 The heavy rain did not make the difficult driving conditions any easier, and I began to despair of seeing a waterfall. 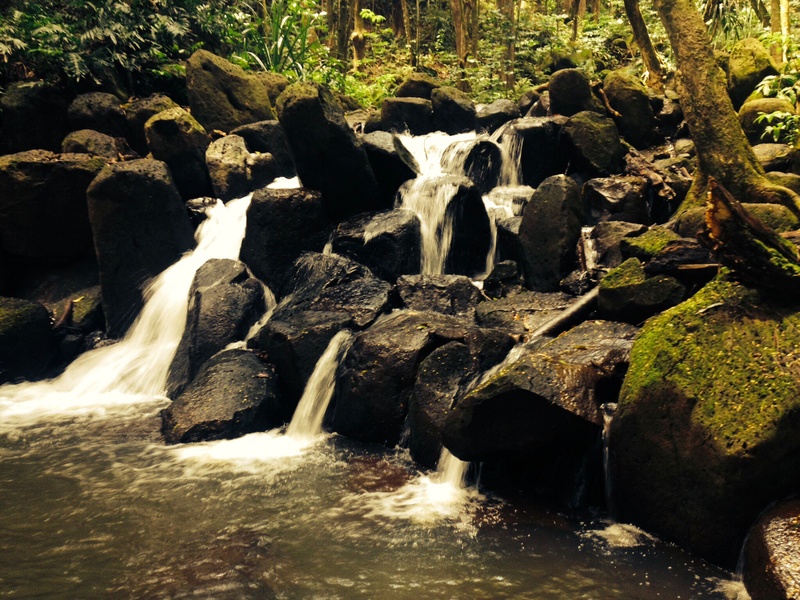 Once more I passed a lovely cascade, known as the Three Bears, and once more I could not stop. I eventually made it to Hana feeling exhausted by the effort. I stopped at Koki beach to watch some locals surf, but the waves were so strong that after 15 minutes they had made little progress and I decided I had better keep going. A detour here was challenging as I had two cars behind me who were very unimpressed by the fact that I obeyed the speed limit, even though in the rain, on an uneven and narrow road and with men working at the side of the road, it would have been unsafe as well as illegal to speed. I eventually was able to pull over and let them pass, which they did with much hooting and gesticulating. My positive mood evaporated, and once more I started to feel daunted by the drive. 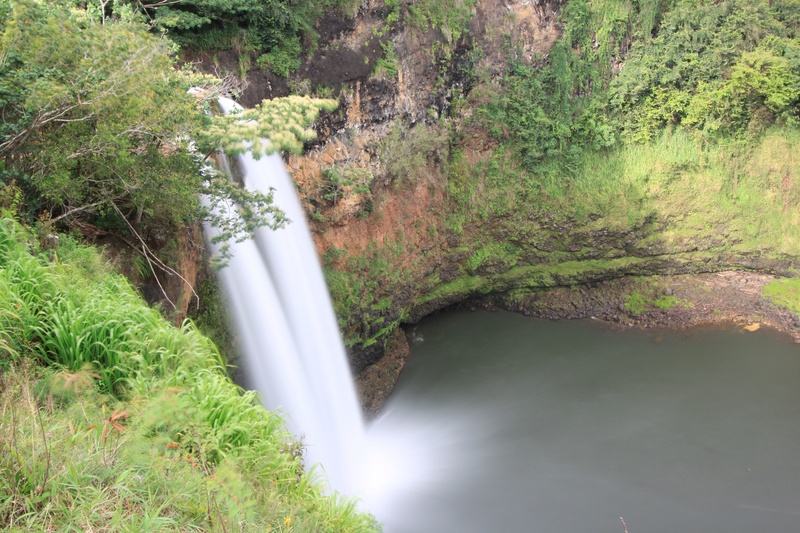 Not long afterwards, I arrived at Wailua Falls and there was space for me to stop. Relieved and cheered up, I pulled over and was able to get some pictures of the falls, playing with my neutral density filter. I decided to continue to ‘Ohe’o Gulch, which was a particularly challenging bit of the drive, with cars heading the other way on roads only wide enough for one car and requiring all of my concentration to stay on the road. On a positive note, I did not have to worry too much about remembering to stay on the right as there was only one side of the road – and the sun came out again along this stretch. Having admired the falls, I struggled to take pictures as I could not see a thing in the bright sunshine but I quite like the moody result even though it was so blustery it is not quite sharp! 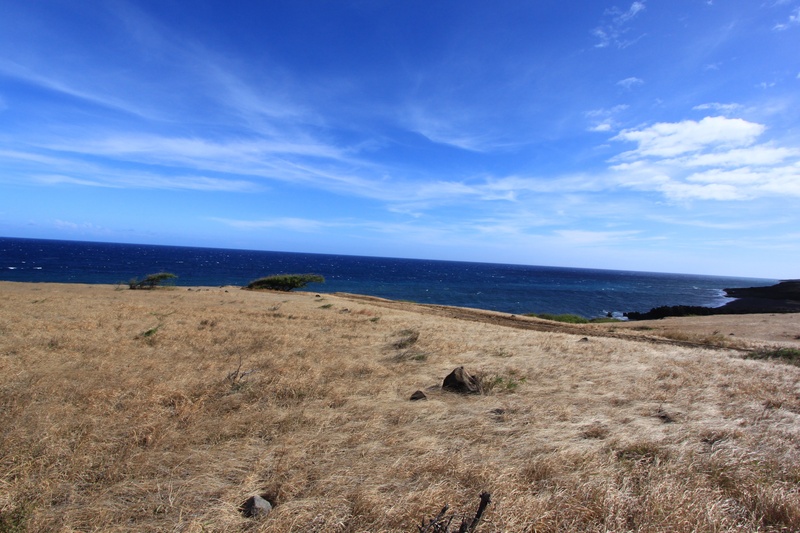 I resisted the temptation to explore further, and chatted to the ranger who persuaded me to continue and complete the loop of East Maui despite the fact that the road was unpaved in places from that point on. As it was shorter, and I was scared of being caught on that terrible road in the dark, I pressed on. I am glad I did. There was not a lot of traffic, and the other cars were content to drive slowly along the gravel road. The initial part was challenging, with many blind corners, but the views were spectacular. 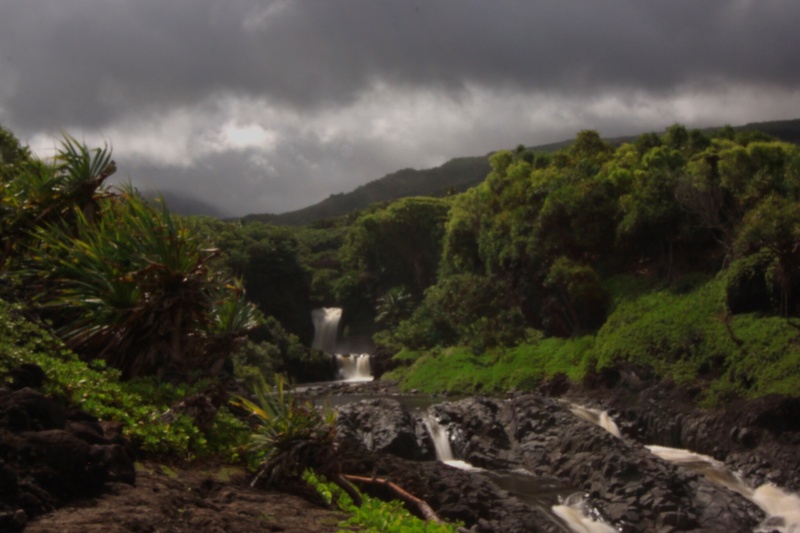 The scenery abruptly changed from the lush jungle to a dry yellow grass and black lava rocks. The road improves as it becomes freshly paved, although it is a single lane in two directions, with signs warning of cattle on the road and lots of little hills where you cannot see if there is a car coming the other way over the rise. 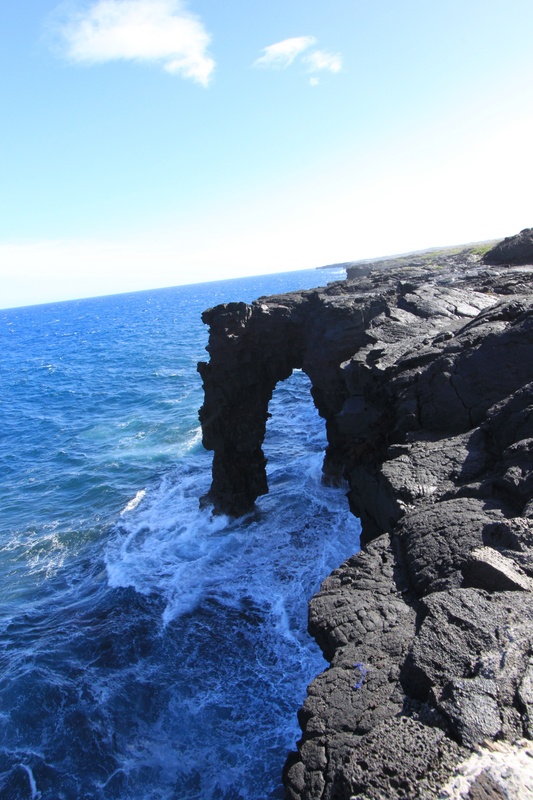 I passed a natural arch of lava and eventually the island’s only winery. Having been driving for 11 hours at this point, I decided regretfully that sampling the wine would not help my driving as I still had a way to go. 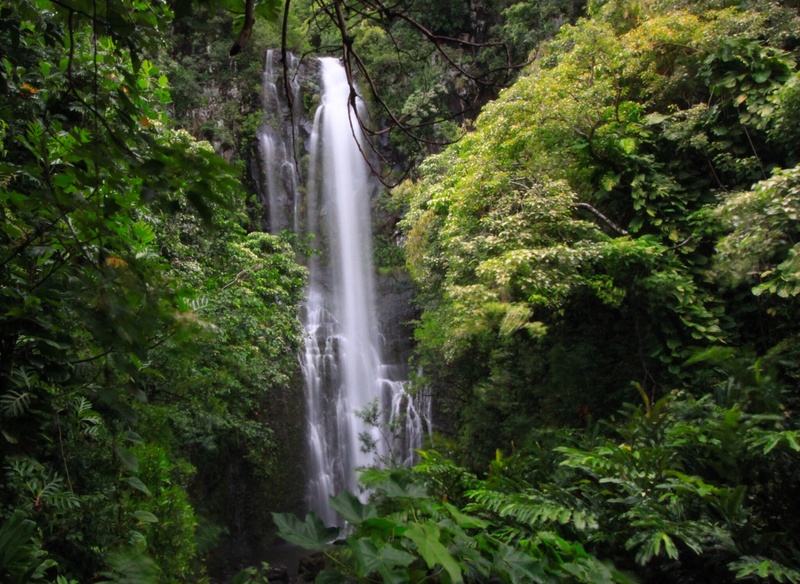 If you ever decide to do that drive alone, my tip would be to stay overnight in Hana to break it up so you will not worry about how much time you are spending at each stop. It took me more than 12 hours and I did not stop much. If I had been able to stop for the hike at Twin Falls at the start of the trip, it would probably have added an hour and a half to my journey. Also, set off really early to ensure you can park at the popular spots. I started at 7.20 am, which was not early enough! There also seemed to be an unwritten rule along the way that you had to be driving a Jeep or a Mustang convertible. The Jeep is probably better for the road, as sitting so low down in the Mustang does not help one see. One big advantage of the Mustang, however, is the soft top which closes at the press of a button. When it first started to rain, I was able to close my roof quickly after feeling a few drops, whereas I passed some people with a Jeep struggling to close theirs by hand in the pouring rain! 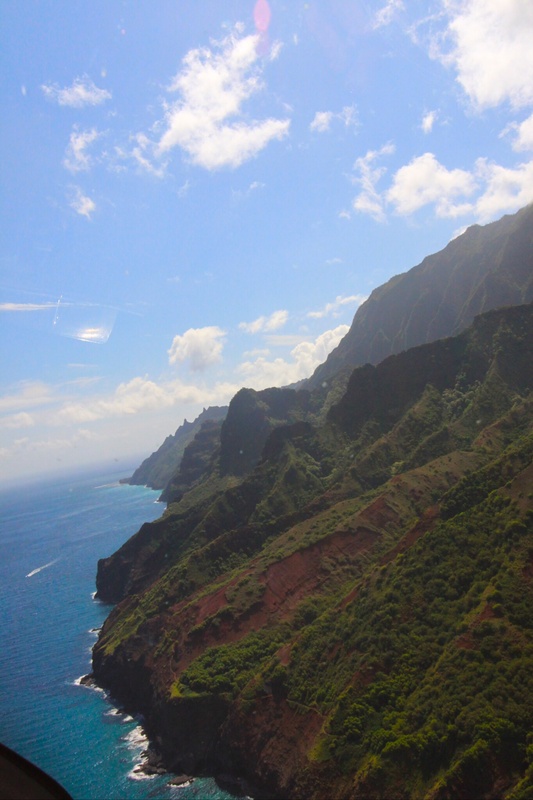 As an alternative to driving, there are bus tours, and joining one of these will mean you focus on the scenery and not on the road, although the road is very winding and if you have motion sickness you may prefer to be driving! And there is the satisfaction of having come through the drive unscathed. 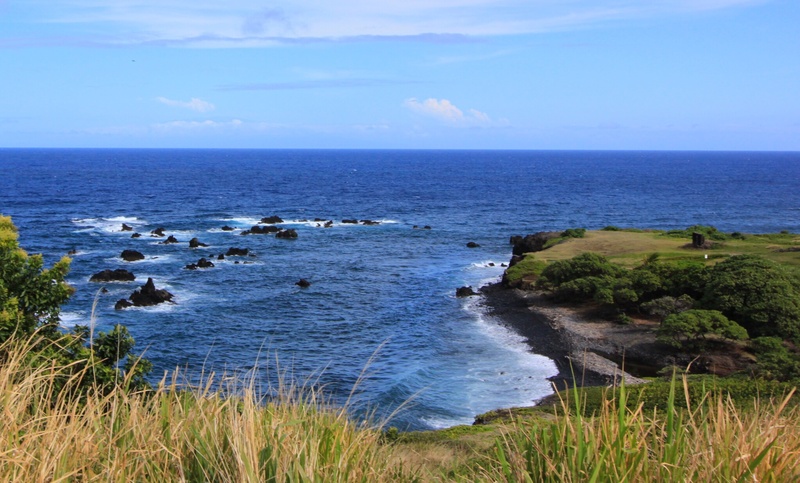 The following day saw me drive 45 minutes to Maalea Harbour for a snorkelling expedition to the Molokini Crater aboard the Trilogy II. Snorkelling at the first reef I saw lots of fish and a moray eel. The eel was gorgeous, pale with black spots. It swam below me for a few minutes before backing into a crevice and gaping its mouth. At the second site I went diving for the first time in years using snuba, where your tank sits on a raft above you. 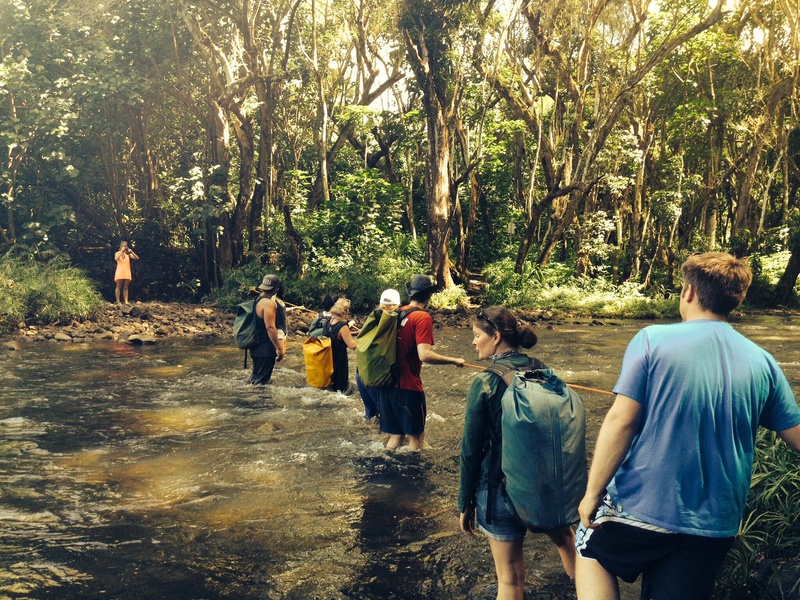 At this site we looked for turtles, and saw one floating gently past us. You will have to take my word for all of this, as I do not have an underwater camera. The sail back was hilarious, with the captain, who was from Japan, cracking jokes in his fluent but heavily accented English. Again there were very nice people aboard. 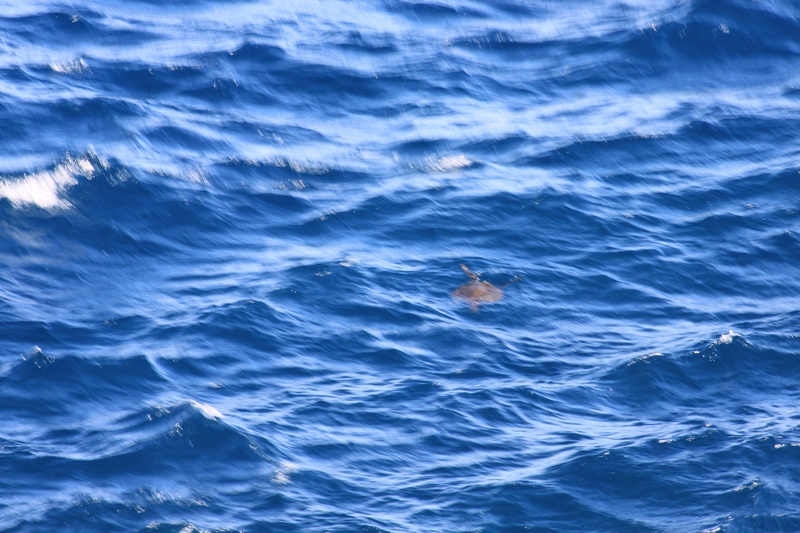 We saw turtles on the surface on the sail back, but I was not quick enough to photograph them before they went under! 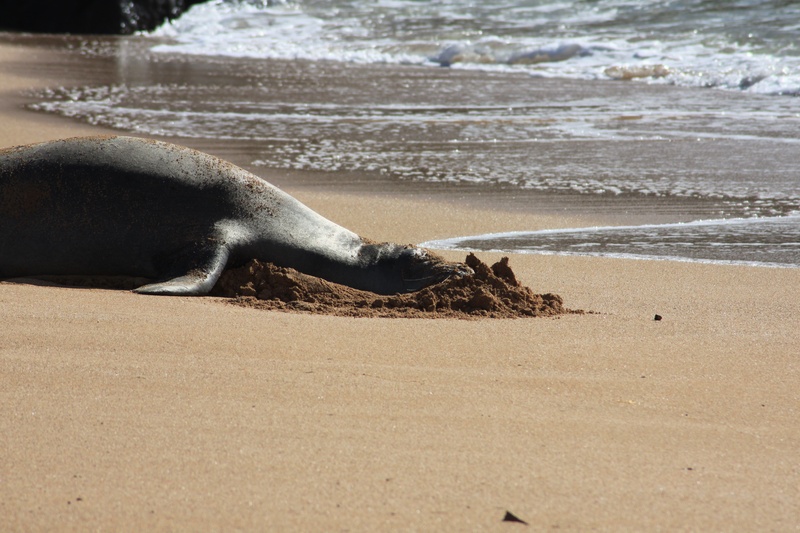 I went for a walk along the beach in the afternoon to see a monk seal which has been coming to the beach just 70 metres or so to the left of my hotel to moult. 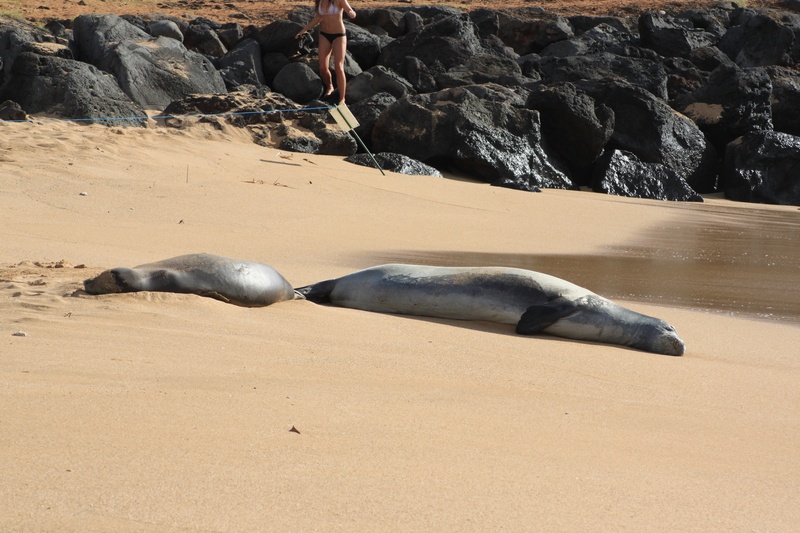 Surprisingly she has been joined by an unrelated young seal, also female. 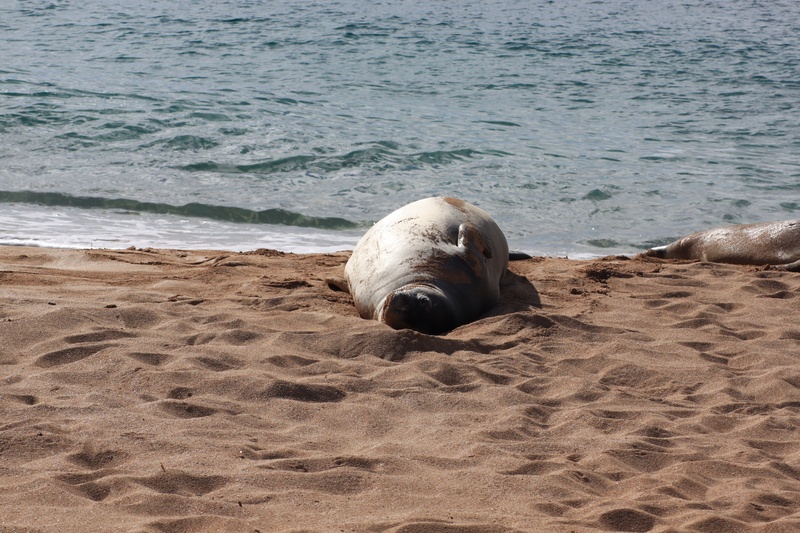 This is surprising as monk seals are so called because they are solitary, but they certainly lay companionably enough snoozing in the afternoon sunshine, occasionally flopping further up the beach as the tide rose. From time to time they would bury their heads in the sand, presumably as it was cooler, then emerge with loud sneezes. Local wildlife conservationists mobilise a team of dedicated volunteers to rope off a section of the beach for the seals, and stop people from disturbing these very endangered animals. They also provide lots of information about the seals to the public, and I learnt a lot from Darren, one of the volunteers. 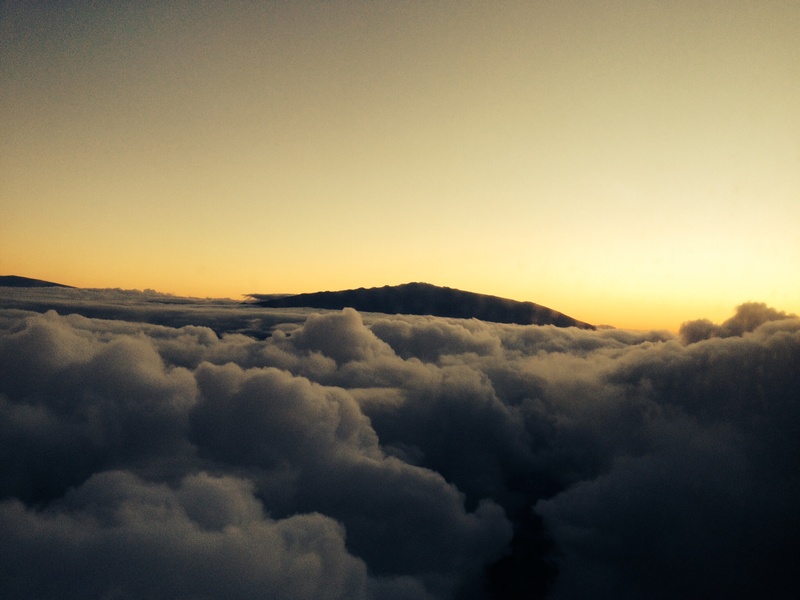 On my last morning I contemplated a pre-dawn start up the mountain to watch the sunrise over Haleakala crater. But a cold and early start driving up a mountain in the dark before rushing back to pack did not appeal as much as a morning run, followed by a swim and packing. Even at 7 am it was a hot run, and when I stopped to visit the seals I was just in time to see them swim off, which gave me no excuse to linger and catch my breath! A brief swim to cool down and I was on my way, top down in the convertible. I stopped to put it back up after about 20 minutes when it became clear my sunblock was no match for the Hawaiian sun! 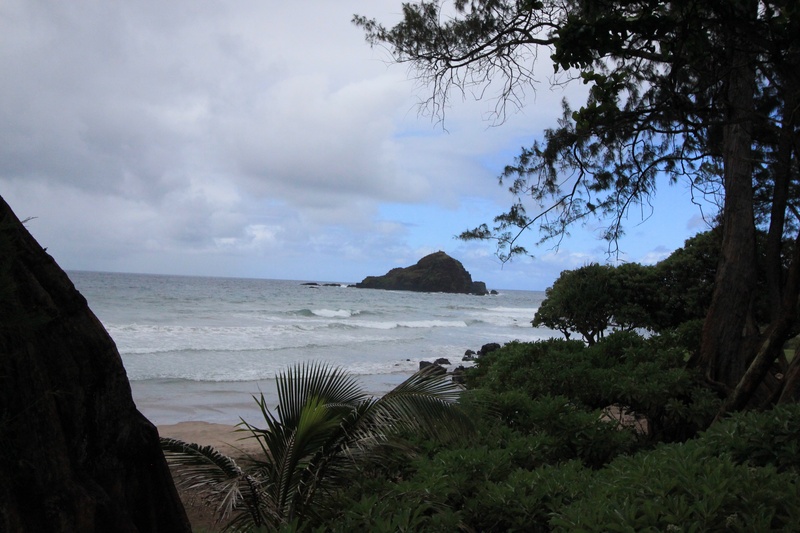 I am on my way to Kauai, having survived the airport at Kahului, which is not air conditioned and is hotter than hell. 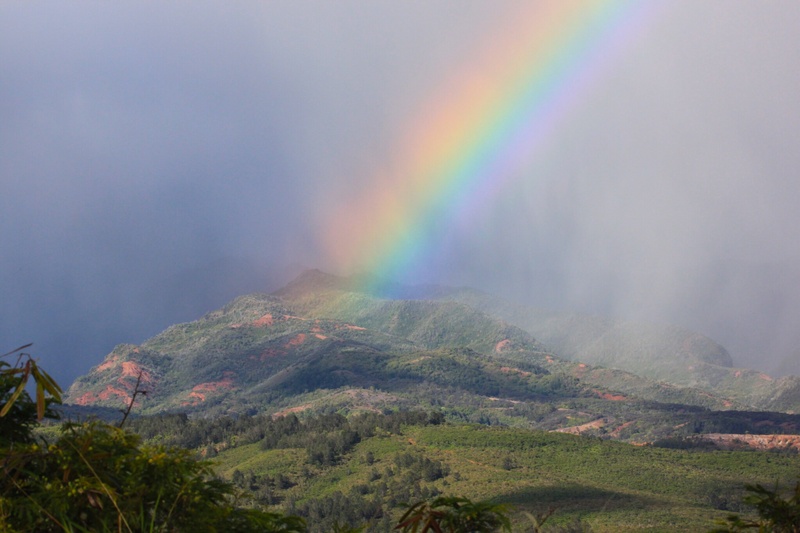 What have I learned in Maui? 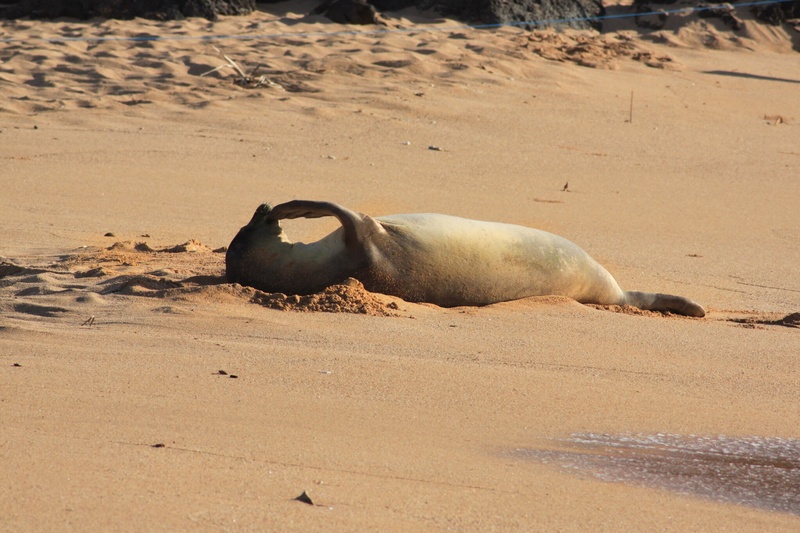 That monk seals usually do not have any friends. That driving at 15 miles an hour can be an adrenaline sport. That you should take an early morning flight when the airport is cooler! And that I have not completed forgotten how to scuba dive. Aloha from Maui. 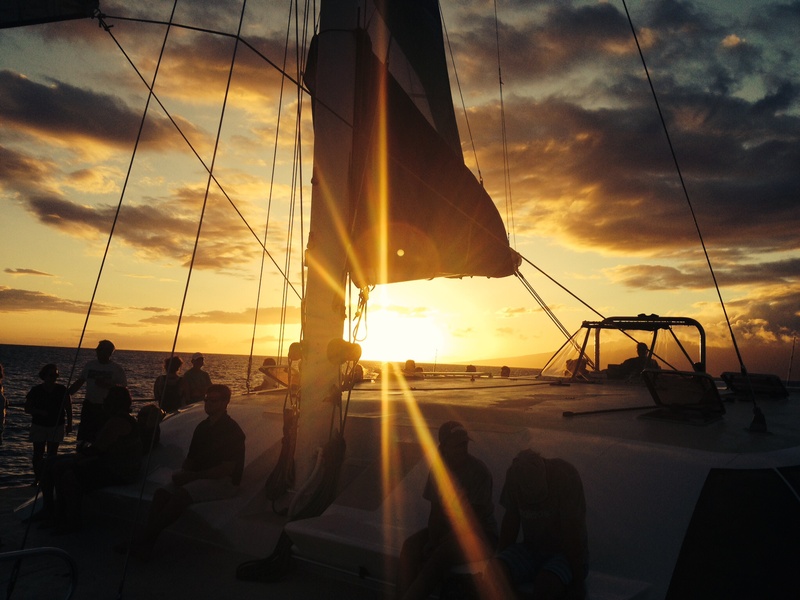 This entry was posted in Hawaii on 13/06/2014 by paulaclarke.